From left to right, Franz K. Ferenz, Barbara Morgan (kneeling), David Giffen, Ragenhilde Liljedahl (Mrs. Giffen), unknown, unknown, Annita Delano, Richard Neutra, unknown, Harwell Hamilton Harris and Gregory Ain. (E. Merril Owens is one of the three unidentified students). Photo by fellow class-member Willard D. Morgan, early 1929. (See Gregory Ain: The Modern Home as Social Commentary by Anthony Denzer, note 39, p. 234). The population of Los Angeles doubled during the 1920s fueled by a balmy climate, relentless boosterism and an economy based on the oil, movie and real estate development industries. Waves of immigrants descended upon Los Angeles from all over the country as well as overseas. Among the newcomers were also much of the artistic community seeking a clean slate and inspiration from a brand new city to break away from the hidebound styles in existence at the time such as the Beaux Arts and revivalist idioms in architecture and industrial design, to pictorialism in photography and representationalism in art. The iconic photo above of Richard Neutra and his 12 disciples in his Academy of Modern Art class "A Practical Course in Modern Building Art" at his Lovell Health House construction site has always symbolized to me an avant-garde group of artists, architects and designers who were struggling to gain a foothold for their beliefs in the context of the rapidly metropolizing Los Angeles of the 1920s. 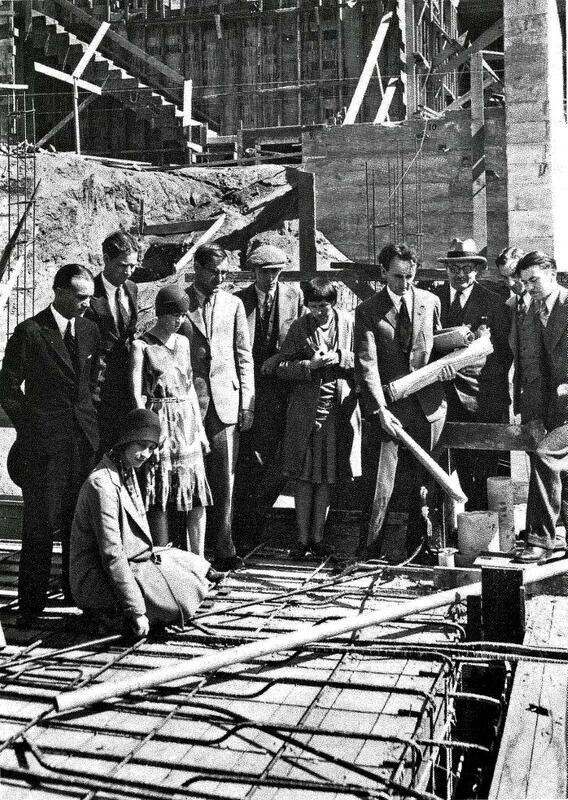 Neutra pointing to the warp and weft of rebar and conduit in the floor slab of the Lovell Health House to me portrays the intertwined lives of the students in this class as they began to weave the very foundations of modernism in Los Angeles. 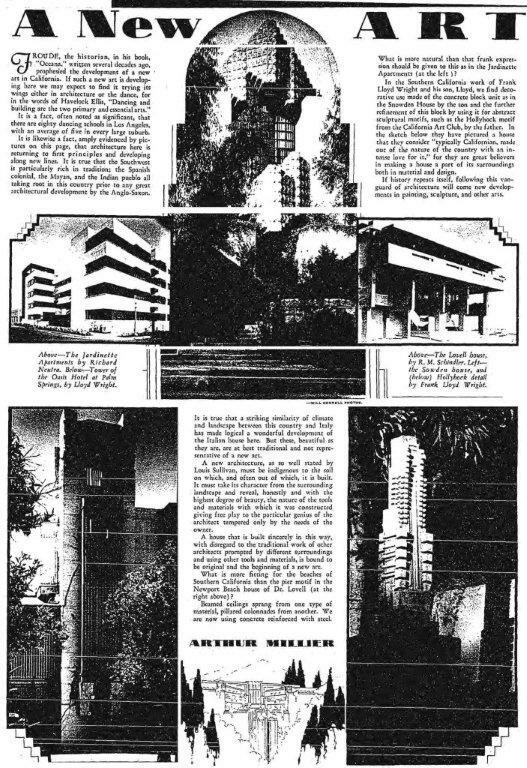 This article is intended a be a cross-section of the beginnings of L.A.'s evolution as a modernist mecca using as a locus Neutra's course and students. I will explore related events leading up to the advent of Neutra's course and then follow selected student's activities as they advanced the cause of modernism, L.A. Style. 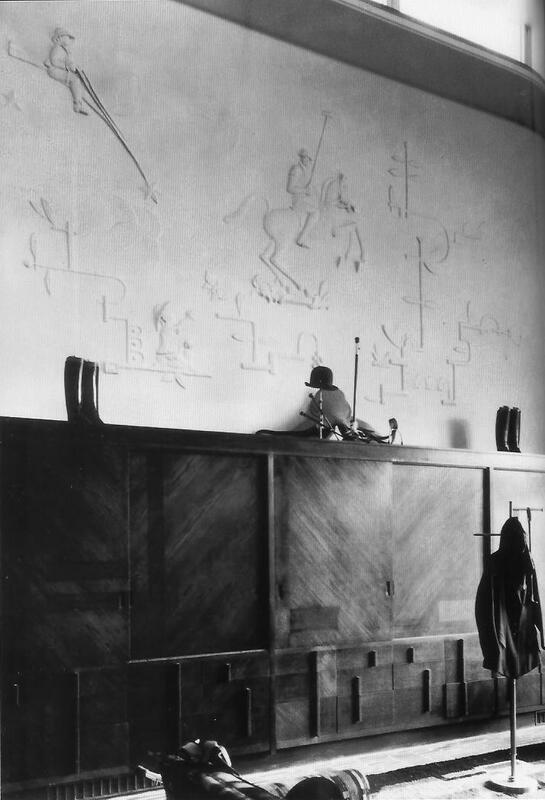 Annita Delano, to Neutra's right in the above photo and long-time UCLA Art Professor and a founding member of the UCLA Art Department in the 1920s, recalled in her Oral History Southwest Artist and Educator, (hereinafter referred to as Delano). "Schindler and Neutra came to Los Angeles to work with Frank Lloyd Wright, and I was privileged to know them right away within the first year after they came here. It seems the architects, designers, painters, sculptors got together. The city was so much smaller. ... We met in a Frank Lloyd Wright house — that is, the Freeman House in Hollywood. It was tremendous to have this get-together with people who were creating. And that's how I got interested [in modern architecture]. (Delano, p. 237). Delano's fascination with modern architecture began at least as early as late 1920 when she took some of her students, including Barbara Morgan nee Johnson, to visit Irving Gill's studio at his home-office at 913 S. Figueroa St.. The introduction may have come via former Gill apprentice Lloyd Wright who was most likely in the Delano-Morgan circle by this time. 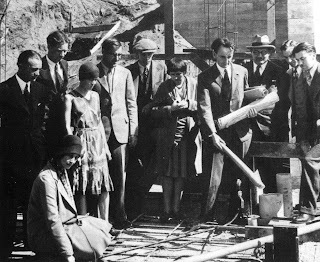 Lloyd was just then breaking ground on his first residential commission for film maker Otto Bollman while supervising construction activity on Aline Barnsdall's Olive Hill a few weeks before the Schindlers arrival in Los Angeles. (For example see my "Tina Modotti, Lloyd Wright and Otto Bollman Connections, 1920"). "A few of us from the Art Department went to Mr. Gill's, an architect whose office is between ninth and tenth on Figueroa the other day. He is quite a character with rather decided and extreme hobbies but with some good ideas. His theory is that people especially housekeepers spend too much time at household drudgery, which isn't new, but to eliminate this time waste he has taken out all of the needless dust catching features in rooms, such as base boards, picture moldings, panelling door and window casings, etc. His chairs are all curves, very beautifully shaped, so that dust doesn't gather in crevices. His floors are cement, treated with acid to give a beautiful mellow brown varied color, and waxed. Somehow they do not seem at all cold but are most agreeable to see and walk upon. His colors in the room are rich, bright and soft.There is much plain wall space broken up in beautiful proportion by the articles of furniture. There are all kinds of interesting things I might tell about him but as you may see by my terrible writing and lack of punctuation I am in a hurry." (Barbara Johnson to Willard Morgan, November 9, 1920. From Morgan Archive, courtesy Lael Morgan). 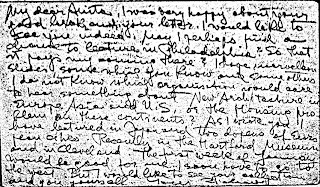 (Author's note: The Schindlers befriended Gill through his former apprentice Lloyd Wright shortly after their arrival in Los Angeles in December 1920. 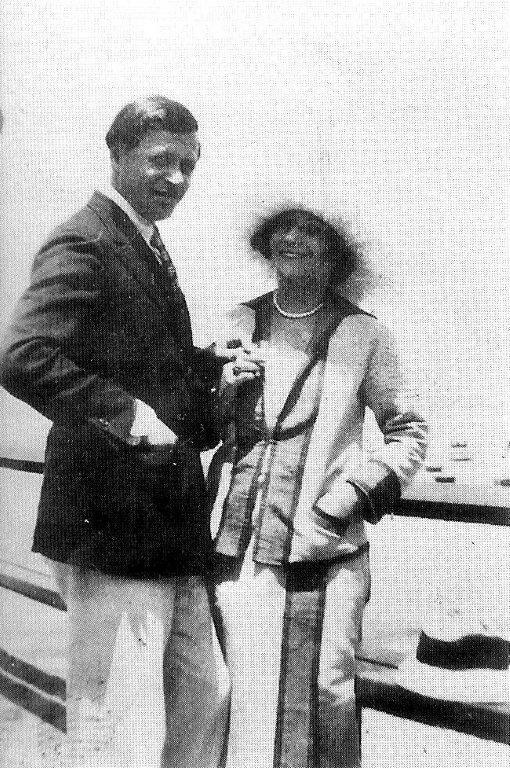 Their 1922 Schindler-Chace housemates, Clyde and "Kimmie" Chace came out to Los Angeles in the summer of 1921 to join the Schindlers at which time Clyde went to work for Gill who was then building the Horatio West Court in Santa Monica). (For much more on this see my "The Schindlers and the Hollywood Art Association" (SHAA)). 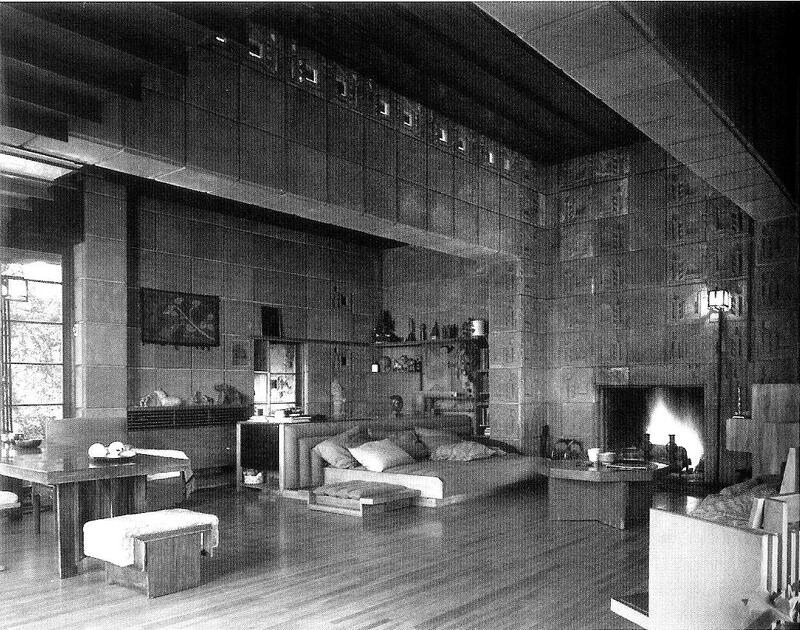 Beginning in 1928, R. M. Schindler replaced Wright as the Freeman "family architect" as he had done in 1924 for Aline Barnsdall. Over the next 25 years the Freemans would commission Schindler to design two guest apartments and over 35 pieces of furniture. Freeman House living room, 1962 Glencoe Way, Hollywood, Frank Lloyd Wright, 1925, with much of the Schindler-designed furniture. From Chusid, Jeffrey M., "Freeman House, 1928-1953" in The Furniture of R. M. Schindler , p. 100. Julius Shulman Job No. 1512, 5-14-1953. 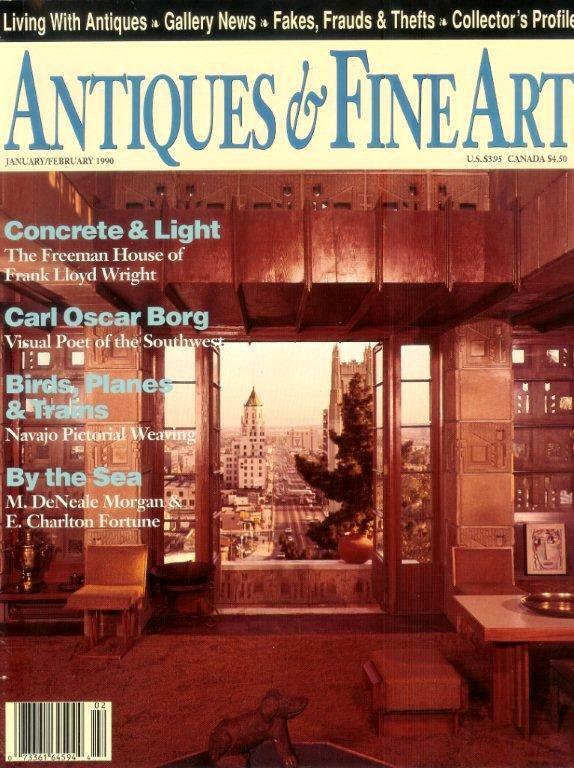 "The Freeman House of Frank Lloyd Wright," Antiques & Fine Art, Jan-Feb 1990. 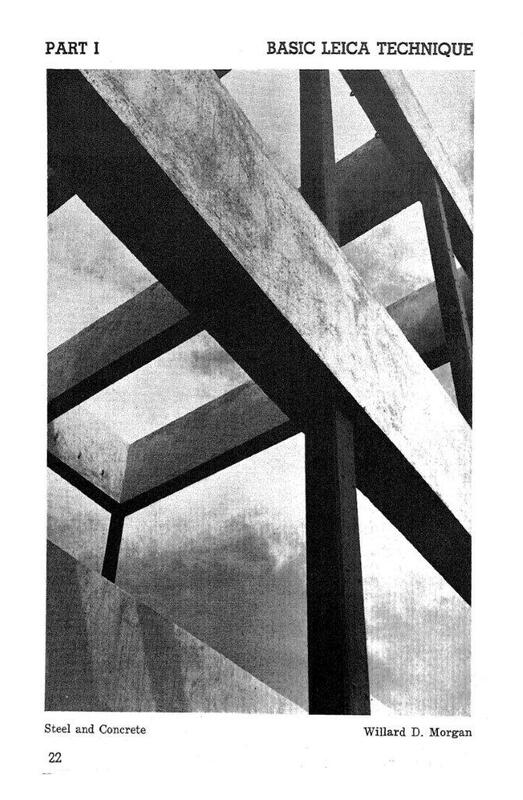 Julius Shulman cover photo. Note Alexej von Jawlensky painting at lower right purchased by the Freeman's from former tenant (in 1933) and representative of Jawlensky's Blue Four, Galka Scheyer. Noted art collectors and salonists, the Freeman's frequent parties gathered many of the same habitues as the Schindlers did for their regular Sunday evening Kings Road salon "events." 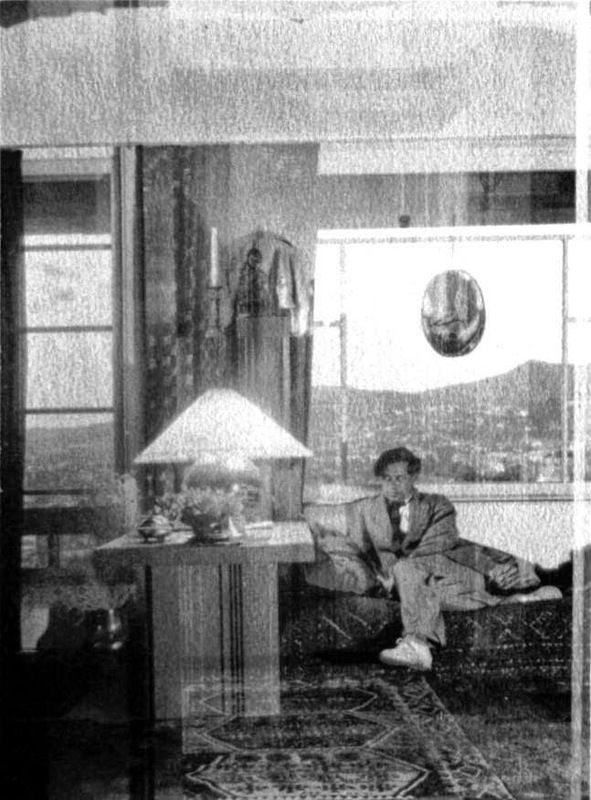 The Schindlers and Freemans also cross-pollinated with attendees of regular get togethers at art patrons Walter and Louise Arensberg's house, book dealer and gallerist Jake Zeitlin's bookstore and numerous other Los Angeles avant-garde venues. (For an in-depth look at the Schindler Kings Road salon circle see my related article "Pauline Gibling Schindler: Vagabond Agent for Modernism, 1927-1936" (PGS) and (SHAA)). "...to supper and an evening of dancing and reminiscing at the Freeman home. (The house is by Frank Lloyd Wright: a fine conception except for the insistent pattern on cement blocks which weakens by over-ornamentation.) ... Harriet dances well: if she were smaller - in bulk - she would be ideal for me. We danced many times to exquisite Spanish tangos." (Author's note: Blue Four representative Galka Scheyer would also briefly live here in the guest apartment in 1931). 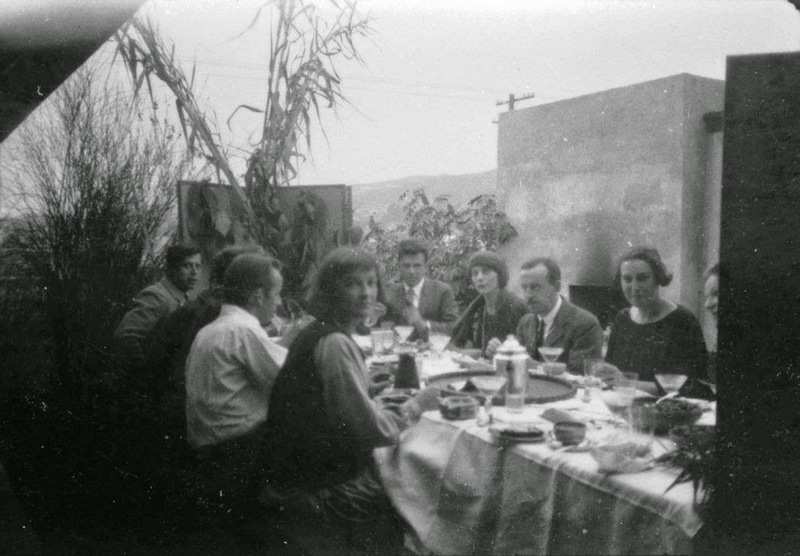 Franz K. Ferenz, (far left in the opening photo) founded the Academy of Modern Art shortly after moving to Los Angeles from New York in 1927. A Viennese emigre like Schindler and Neutra, Ferenz first came to the U.S. in 1914, the same year as Schindler. A citizen since 1919, Ferenz became a successful book dealer and gallery owner at 425 Madison Avenue (at 49th St.) where he sold Viennese arts & crafts, books on fine and industrial art and etchings and prints. (Bulletin of the Art Center, New York, June, 1923, p. 242). (For much more on Ferenz see my "Kem Weber's Whitley Heights Enclave"). Fine Arts Building, ﻿811 West 7th Street, Walker & Eisen, 1927. (From internet). 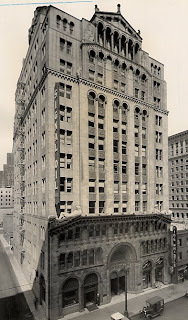 Ferenz first opened his Academy on the seventh floor of the brand new Fine Arts Building at 811 West 7th Street designed by Walker & Eisen (see above) in 1928. Ferenz later opened another Academy branch at the Plaza Art Center at 53 Olvera St. in 1931. Ironically, Neutra's course in "moden building art" featuring his hard-edged, ornament-free "International Style" Lovell Health House would be taught in a classic Beaux-Arts building with Spanish Renaissance and Romanesque elements faced with ornate Gladding, McBean terra cotta and Batchelder -tiled art exhibition bays in the two-story atrium entrance lobby. 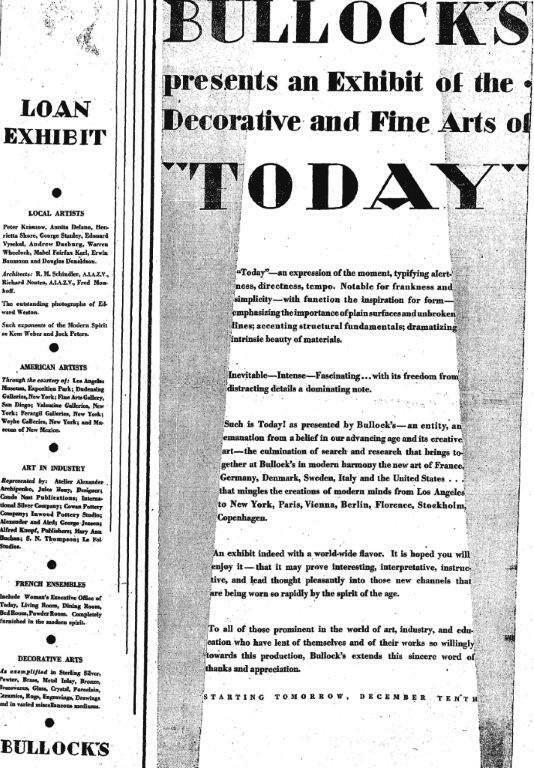 Salon of Ultra Modern Art announcement for a lecture on "Spacial Architecture" by R. M. Schindler, October 16, 1928. Courtesy of the Schindler Archive, UC-Santa Barbara Art and Design Collection, University Art Museum. Ferenz likely quickly befriended fellow Viennese emigres Neutra and Schindler shortly after they moved to Los Angeles as he, along with Richard and Dione Neutra and Gregory Ain, attended an October 16, 1928 Salon of Ultra Modern Art event honoring R. M. Schindler (see above). (Levy, Juana Neal, "Affairs of the Week: Delightful Affair," Los Angeles Times, October 21, 1928, p. III-3). The Salon was hosted by Mr. and Mrs. Frank C. Wamsley at their 1121 El Centro Ave. studio in Hollywood. Ferenz and Schindler were also listed as patrons of the Salon in a January 1929 Los Angeles Times article. 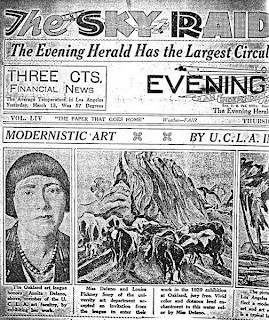 (Nye, Myra, "New Art Salon Gains in Favor; Project of Sculptor's Wife," Los Angeles Times, January 25, 1929, p. I-8). Course Announcement for "A Practical Course in Modern Building Art" taught by Richard Neutra for F. K. Ferenz's Academy of Modern Art. From Richard Neutra: Promise & Fulfillment , p. 175). Around this same time Ferenz hired Neutra to conduct a series of lectures at his Academy of Modern Art which were religiously attended by Harwell Harris and Gregory Ain (second from right and far right in the opening photo). 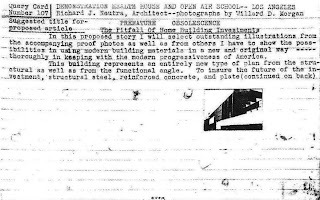 At Ain's and Harris's urging, Ferenz then hired Neutra to teach "A Practical Course in Modern Building Art" (see class announcement above) which began on January 29 and continued through May 29, 1929. 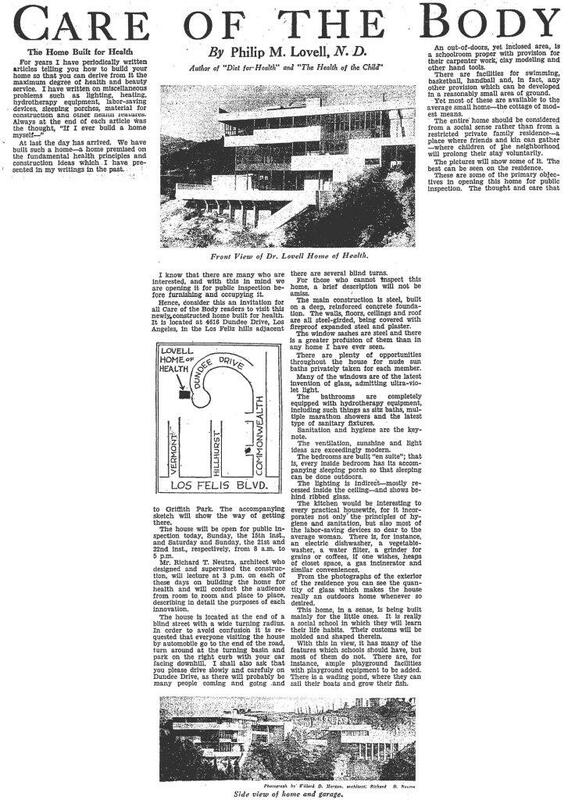 (See The Organic View of Design by Harwell Hamilton Harris, p. 55 (Harris) and "Neutra to Lecture," Los Angeles Times, February 3, 1929, p. III-14). 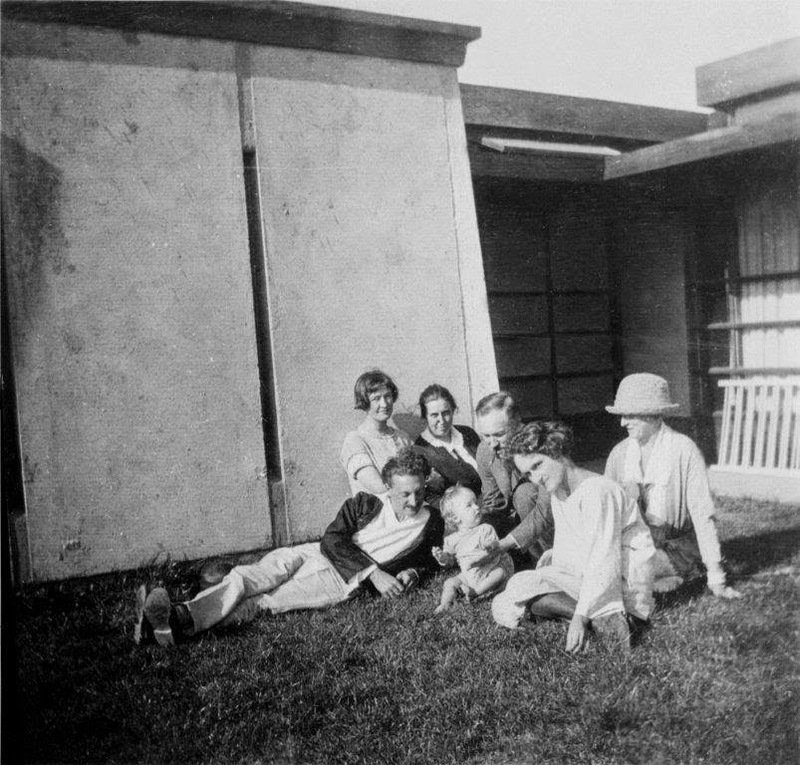 Ferenz, Ain and Harris were joined in the class photo at Neutra's Lovell Health House by Annita Delano, Barbara Morgan and her husband, class photographer and previous Neutra collaborator, Willard D. Morgan, David Giffen and Ragenhilde Liljedahl (Mrs. Giffen), E. Merrill Owens and three unidentified students (see opening photo). Millier, Arthur, "A New Art", L.A. Times Mid-Winter Number, January 2, 1929. 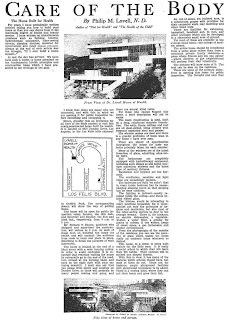 Earlier the same month, and shortly after the groundbreaking for Neutra's Lovell Health House, L.A. Times art critic Arthur Millier published the above article in the annual Mid-Winter number equating the work of Neutra, Schindler and Lloyd Wright to a "new art" breaking away from the eclectic revivalism then in vogue around Southern California. 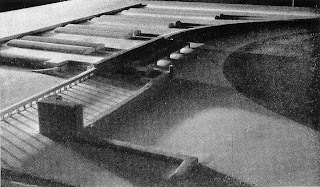 ﻿Sketch for Neutra class, Harwell Hamilton Harris, 1929. From Harwell Hamilton Harris by Lisa Germany, p. 30. Neutra had each of his students choose an individual design problem and conducted the class as a working studio. Harris selected for his project a single family residence and Ain designed a prefabricated penitentiary. (Harris and Gregory Ain: The Modern House as Social Commentary by Anthony Denzer, p.31). It can be seen from Harris's above design sketch for a home for a boyhood friend that he was strongly influenced by Neutra's Lovell Health House, Jardinette Apartments and the work of Frank Lloyd Wright. No evidence remains of the class projects by Ain or the other students. After the class ended, Harris, Ain, David Giffen and wife Ragenhilde Liljedahl (see credits in caption below) continued to work at night in vacant Academy of Modern Art classrooms on the various elements of Neutra's theoretical Rush City Reformed. This extracurricular exercise in essence provided the fortunate apprentices an extremely intense three-year course in architecture and city planning squeezed into one. (McCoy, Esther, "Gregory Ain" in The Second Generation , p. 87 and Organic View of Design, p. 69). From Terminals? - Transfer! by Richard J. Neutra, The Architectural Record, August 1930, p. 103. (From my collection). While preparing the various elements of Rush City including the air terminal above, Neutra and his apprentices entered the Lehigh Portland Cement Airport Competition along with fellow Los Angeles architects, A. C. Zimmerman & William H. Harrison (first prize winners), H. Roy Kelley (honorable mention), Lloyd Wright, Charles A. Stone & Ulysses Floyd Rible, Clarence L. Jay, Arthur B. Gallion (future Dean of the USC School of Architecture), H. L. Gogerty and others. The above drawing and below model illustrate how the Rush City airport arrivals and departures would integrate with the other transportation infrastructure elements of a bustling metropolis. ﻿Rush City Air Transfer, Air View of Model, Willard D. Morgan photo. From "Terminals? - Transfer!" by Richard J. Neutra, The Architectural Record, August 1930, p. 103. (From my collection). 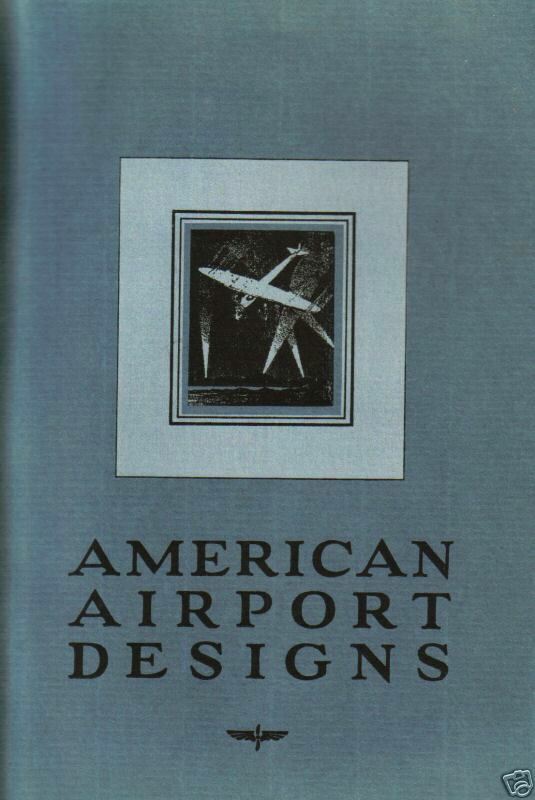 American Airport Designs , Lehigh Portland Cement Company, 1930. (From my collection). 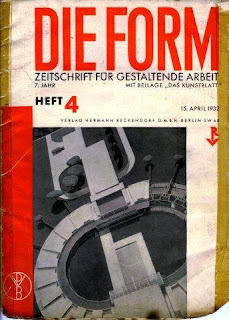 Neutra also published an article under Harris's byline in the April 1930 issue of Die Form "Ein Amerikanischer Flughafen" describing the Airport Design Competition which was also incorporated into the overall Rush City Reformed planning effort. 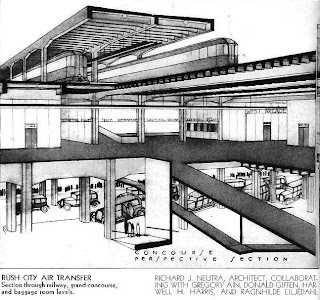 ﻿Ring Plan School, Rush City Reformed, Richard Neutra, Die Form, April 15, 1932. Courtesy Neutra Papers, Department of Special Collections, Charles E. Young Research Library, UCLA. Note the integration of the above Ring Plan School within the context of Rush City below with appropriate green buffer zone between the school (No. 6 at the lower left in the below photo) and adjacent row housing and low, medium and high-rise apartment buildings. Always thinking many steps ahead, in 1929 Neutra shrewdly made use of his impressionable and devoted disciples to form an American Chapter of the Congres Internationaux d'Architecture Moderne (CIAM) with Harris and Ain as officers. (See my California Arts & Architecture: A Steppingstone to Fame: Harwell Hamilton Harris and John Entenza: Two Case Studies for more discussion on this). 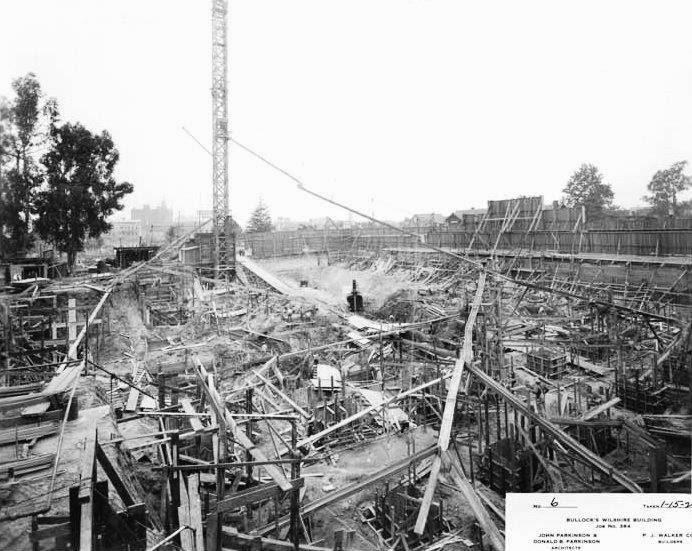 CIAM's third international congress, with City Planning as the theme, was being held in Brussels in 1930. With design fees, Lovell Health House plans and Willard D. Morgan construction photos and drawings for a finally completed Rush City in hand, Neutra set sail for Europe and the CIAM conference by way of Japan in May 1930 in a monumental effort to make a name for himself. 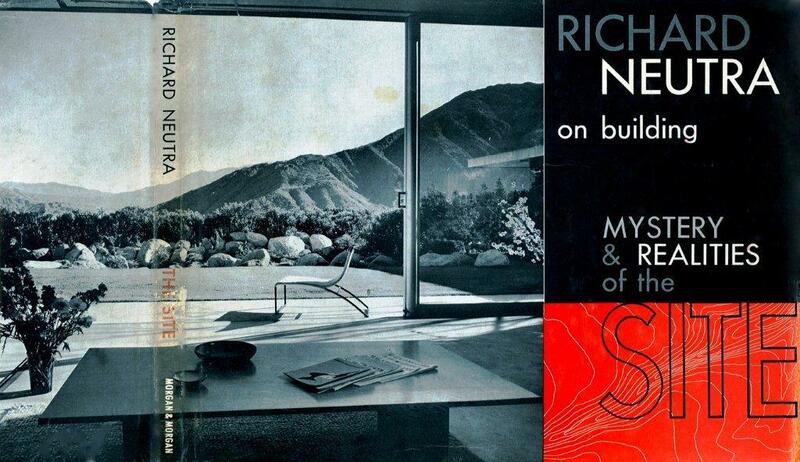 Neutra wrote ahead of time to architects and editors in the cities he planned to visit along the way to arrange speaking engagements and publication of articles. All this exhaustive planning was being done while completing his second book Amerika: Die Stilbildung des Neuen Bauens in den Vereinigten Staaten (see below) which was also published during 1930. Ain and Harris, witnessing this whirlwind of activity first hand, were thus provided with the most invaluable experience in how to launch and market their own fledgling careers as they could ever have imagined. (See my The Post-War Publicity Partnership of Julius Shulman and Gordon Drake for a similar analysis of how Harris passed these lessons along to his disciple Gordon Drake in the 1940s). Amerika: Die Stilbildung des Neuen Bauens in den Vereinigten Staaten by Richard J. Neutra, Verlag Von Anton Schroll, Wien, 1930. El Lissitsky cover photo montage includes images by Brett Weston (See PGS). (From my collection). 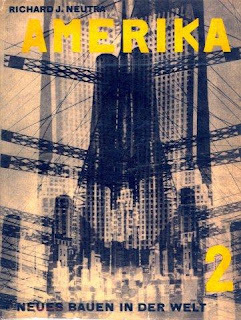 (For much more on the story behind this iconic cover see my "Brett Weston's Smokestacks and Pylons, 1927"). Annita Delano is a much under recognized figure in the advancement of Los Angeles Modernism as she was one of the more aggressive and successful avant-gardist cross-pollinators along with Pauline Schindler and Blue Four representative Galka Scheyer seen below. Annita graduated from Porterville Union High School in 1914 and was her class valedictorian. She then moved to Los Angeles to attend State Normal School on Vermont near Melrose. Upon graduation, Delano began teaching there in 1918. In 1919, the Normal School became the University of California, Southern Branch. 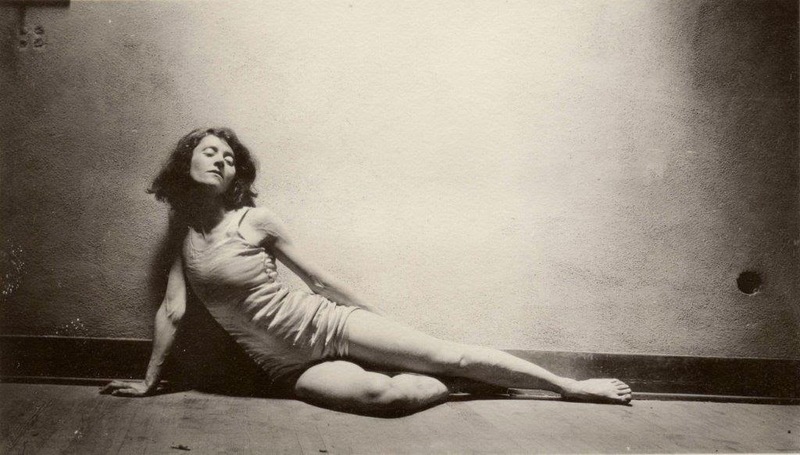 She befriended Pauline Schindler's sister Dorothy who joined the Physical Education Department faculty at the school from 1922-24 and taught alongside Edward Weston dancer muse Bertha Wardell and by then intimate friend Barbara Morgan. (For much more on this see my "Bertha Wardell Dances in Silence at Kings Road, Olive Hill and Carmel"). Front row from the left, R. M., Mark and Pauline Schindler, rear, Edith Gutterson Howenstein, E. Clare Schooler, Edmund Gibling and Dorothy Gibling. Kings Road ca. 1922-3. Courtesy of the Schindler Archive, UC-Santa Barbara Art and Design Collection, University Art Museum. Bertha Wardell, Morro Bay, August 1925. Photo by Barbara Morgan. Courtesy Lael Morgan, Morgan Archive. 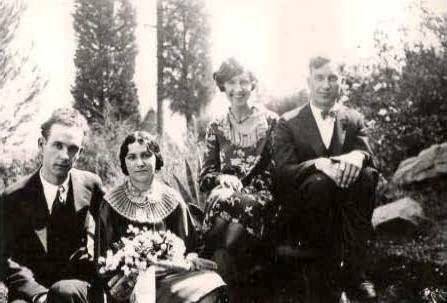 Delano and Scheyer most likely met at an event at either Kings Road or the Freeman House possibly as early as the summer of 1925 when Scheyer arrived from New York on June 8 with Gela Archipenko. 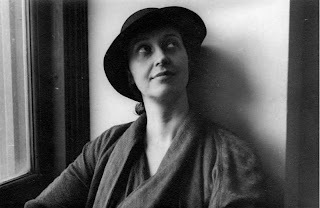 Scheyer and Archipenko stayed in Los Angeles for 10 days before continuing on to San Francisco where Scheyer began her West Coast quest to market a group of expressionist artists she coined "The Blue Four," which included Lyonel Feininger, Wassily Kandinsky, Paul Klee and Alexej Jawlensky. 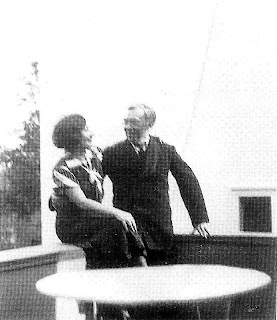 Herman Sachs and Galka Scheyer, Los Angeles, June 1925. 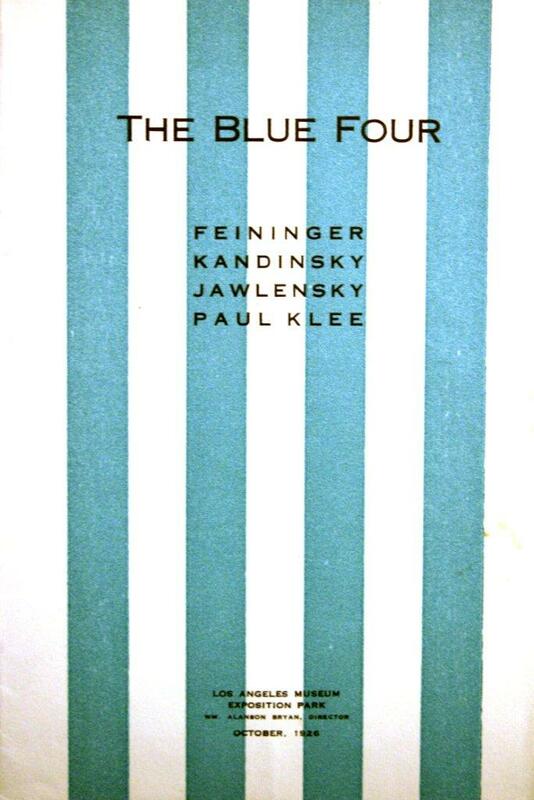 (Baumgartner, Michael and Houstian, Christina, "The Blue Four: Chronology of Events" in The Blue Four: Feininger, Jawlensky, Kandinsky, and Klee in the New World , p. 327). Scheyer was likely introduced to Schindler and future personal architect Neutra through a meeting possibly arranged in advance by Paul Klee. During her short stay Scheyer also met Pauline and R. M. Schindler friend from Chicago (and possibly even Vienna), collaborator and soon-to-be client, Herman Sachs (see above) who was friends with Klee during their late 1910s Munich days. Sachs would later assist Scheyer in making contacts with people in the Hollywood film industry. (Houstian, Christina, "Minister, Kindermadchen, Little Friend: Galka Scheyer and The Blue Four" in The Blue Four: Feininger, Jawlensky, Kandinsky, and Klee in the New World , p. 42). (Author's note: Scheyer also possibly met the managing director of the Otis Art Institute Karl Howenstein and his wife Edith and their circle of artist faculty and friends during her stopover). "Program for the Chicago Industrial Arts School" by Herman Sachs, Hull-House, Chicago, April, 1921. (From my collection). 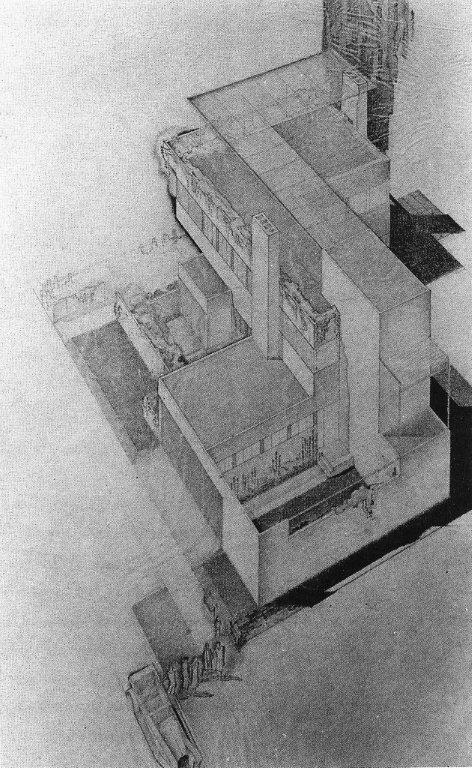 Like Pauline Schindler and Richard Neutra, Sachs had taught at Jane Addams' Hull-House in 1921 where he was valiantly trying to establish an industrial arts school along Bauhaus lines (see above). He was also the American representative of the artist George Grosz, thus likely had much of interest to share with Scheyer regarding marketing European art in America. From left to right, Franz K. Ferenz, Barbara Morgan (kneeling), David Giffen, Ragenhilde Liljedahl (Mrs. Giffen), unknown, unknown, Annita Delano, Richard Neutra, unknown, Harwell Hamilton Harris and Gregory Ain. (E. Merril Owens is one of the three unidentified students). Photo by fellow class-member Willard D. Morgan, early 1929. Schindler-Sachs mutual friends Annita Delano (above center) and Barbara Morgan (above kneeling), U. C. Southern Branch art teachers, had also befriended Sachs by at least 1924 evidenced by Barbara's lengthy description of Sach's Culver City studio in a letter to her then fiance Willard Morgan. "Herman Sachs showed us some beautiful work at his studio the other night. Books that he had bound in papers he had dyed, pottery figurines, pottery of all kinds and of many glazes which he had made, among them an orange glaze (difficult color to obtain), many batiks of all kinds of designs bold and subtle, and silver ornaments. He had a number of panels of which the design was made with fine stitches of fine woolen threads and another hanging on a wall which was strangely crocheted in the riches[t] gamut of colors. There was a number of dolls fantastically designed caricatures of people he had known. He showed us the manuscripts of three books that are to be published in Germany soon, one on Anatomy, "How to Paint" and one on "Frescoes" (see later below) all with illustrations. Then too there was a huge bookcase filled with rare illustrated art text books, folklore etc. etc. etc. He's an interior decorator and is at present designing the interior of a bank in Santa Ana. Thruout seeing these there ran a semi argument Sachs vs. all the rest on American art but we great more understanding. He surely understands the economic system which strangles art. Out of doors we could see a lurid glow in the night sky. He explained that the lumber companies give a discount to these Culver City film companies and doubtless it is the same other places, if the companies burn all of the lumber in a once used set. Accordingly men are hired who do nothing but burn sets. Thrifty and far-sighted business methods!" (Letter from Barbara Johnson to Willard Morgan, September 9, 1924. Morgan Archive. Courtesy Lael Morgan. For much more on this see my "The Schindlers and the Hollywood Art Association" (SHAA) and "Herman Sachs Batik, 1920"). Herman Sachs, 1925. Viroque Baker portrait. 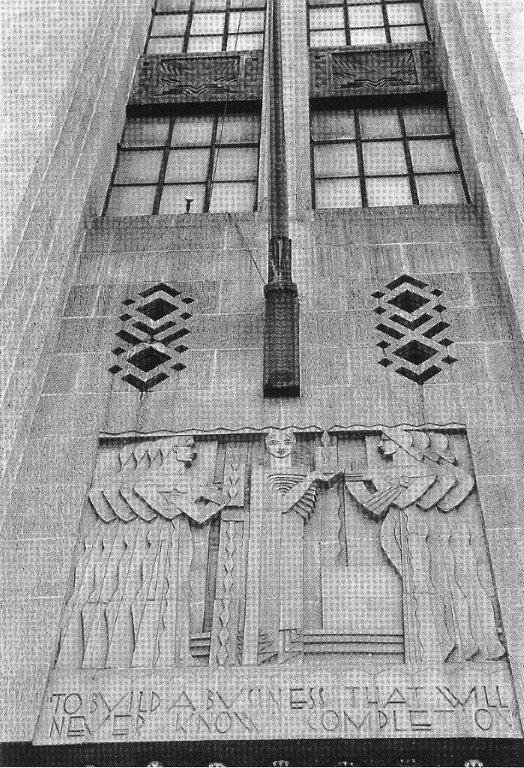 (Anderson, Antony, "Of Art and Artists: Sachs Decorates New Gas Building," LAT, February 5, 1925, p. 30). Scheyer moved into the Normandie Hotel in San Francisco and began lecturing on the Blue Four and soon met William H. Clapp, an artist who was part of the Society of Six group and director of the Oakland Art Gallery. 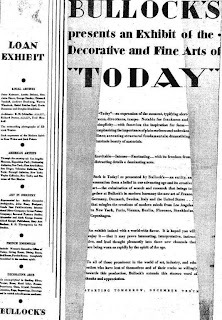 Through his largess, Scheyer was able to mount numerous exhibitions in the Bay Area which she shrewdly parlayed into the below front-page article in the influential San Francisco Examiner. ﻿From left: Galka Scheyer, Lyonel Feininger, Wassily Kandinsky, Paul Klee and Alexej Jawlensky. "Prophetess of "The Blue Four," San Francisco Examiner, November 1, 1925. Catalog cover design for the second exhibition of the Modern Art Workers at the Los Angeles Museum of Art, March 1926 designed by R. M. Schindler. Courtesy of the Schindler Archive, UC-Santa Barbara Art and Design Collection, University Art Museum. The "Workers" exhibited along with other members from the Schindlers' circle besides spokesperson and manifesto author Stanton MacDonald-Wright, fellow Delano art teachers at Otis Art Institute Harold Swartz (see below), Edouard Vysekal and Frederick Monhoff, Kem Weber, former Harwell Hamilton Harris Otis sculpture classmate and soon-to-be Oscar statuette sculptor George Stanley (see below), Gjura Stojana, Morgan Russell, Conrad Buff, Helena Dunlap, Henri De Kruif, Mabel Alvarez, and many others. 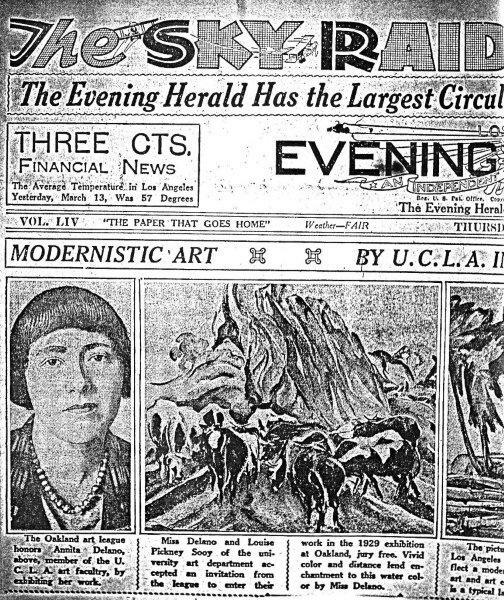 (See "Modernists Show: Hollywood Library," L.A. Times, October 11, 1925; "Modernists' Show at Los Angeles Museum," L.A. Times, March 14, 1926, p. III-19; and California Arts & Architecture: A Steppingstone to Fame: Harwell Hamilton Harris and John Entenza: Two Case Studies). Sculpture class at Otis Art Institute, 1924: Fourth from left, future Schindler client and Herman Sachs employee Pasquale Giovanni Napolitano, Instructor Harold Swartz in center; continuing right: Ruth Sowden, who encouraged Harris to discover Frank Lloyd Wright and commissioned son Lloyd Wright to design the Sowden House seen in the Millier "A New Art" article above; Viola Kepler (model); George Stanley (future designer of the "Oscar" statuette); Clive Delbridge (Harris's client for his first building, the Lowe house); and Harwell Hamilton Harris. (From Otis Collections Online). "These artists have used all the decorative and structural elements in creating new forms. You will find color and light, perspective and modeling used in the modern sense. 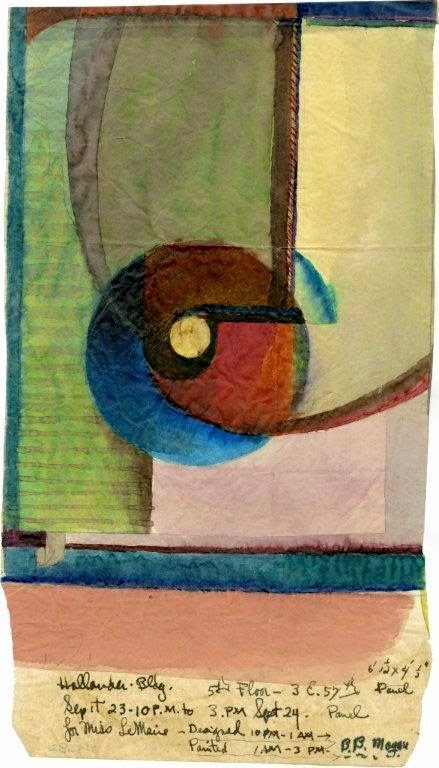 Some are built of successive planes moving into deep space all related to form a composition, while others are built of rhythmic color units which do not penetrate so deeply into space, but which present a harmonious ensemble through extreme simplicity of expressive line and subtle color gradations." (Delano, Annita, "The Blue Four," in Dark and Light, October 1926, p. 2). 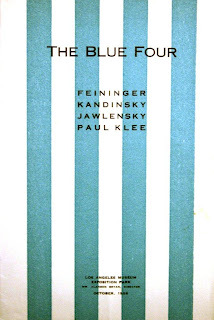 ﻿Catalogue for traveling "Blue Four" exhibition, Los Angeles Museum of Art, October 1926. Courtesy of Getty Research Institute, Peg Weiss Papers. "I remember putting up an exhibit for Galka Scheyer. She came with some other friends; a man helped her with these priceless paintings. We had no insurance or any guarantee that anything would be done if anything happened to them. We had Paul Klees; I put them all over the classrooms and up in that third floor — most of the classrooms were up on the second floor — and we had these originals all over the galleries, and the students could look at them directly." (Delano, p. 114). Scheyer wrote of the U. C. Southern Branch exhibition in an unpublished manuscript "America's Youth and Modern Art,"
One student came enthusiastically to me after a lecture and asked whether I wanted to live in her house. I turned down her offer, since I was only in L.A. for a few days. She looked at me very sadly and said: "But its a Frank Lloyd Wright [Freeman] house! Treat it as if it were your own." I accepted, moved later that night after a party into the F.L.W. house, where I [was given] the most beautiful room, with glass walls and doors that led to grass lawns, and a scintillating view of Hollywood, the oil wells sparkling like Jacob's ladders. It. was a dream filled with the perfume of flowers, light, and nightlife." (Galka E. Scheyer and the Blue Four Correspondence, 1924-1945 edited by Isabel Wunche, p. 348). 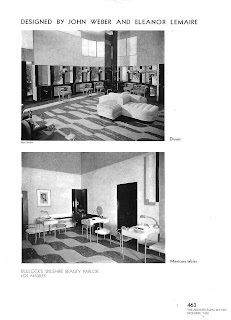 Delano also curated numerous exhibitions for her Kings Road-Freeman House salon friends including Edward Weston, Peter Krasnow, Richard Neutra, R. M. Schindler and others at the same venue and later at the Westwood campus after the school moved in 1929 and changed its name to UCLA (see below). 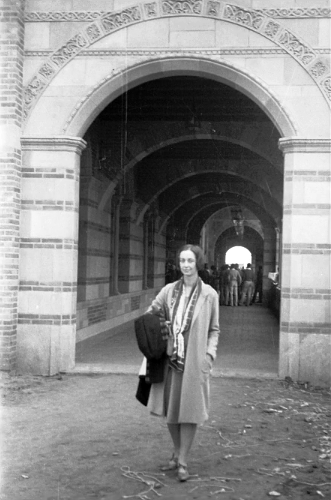 Barbara Morgan at UCLA, 1929. Photo by Willard D. Morgan. Courtesy Lael Morgan, Morgan Archive. 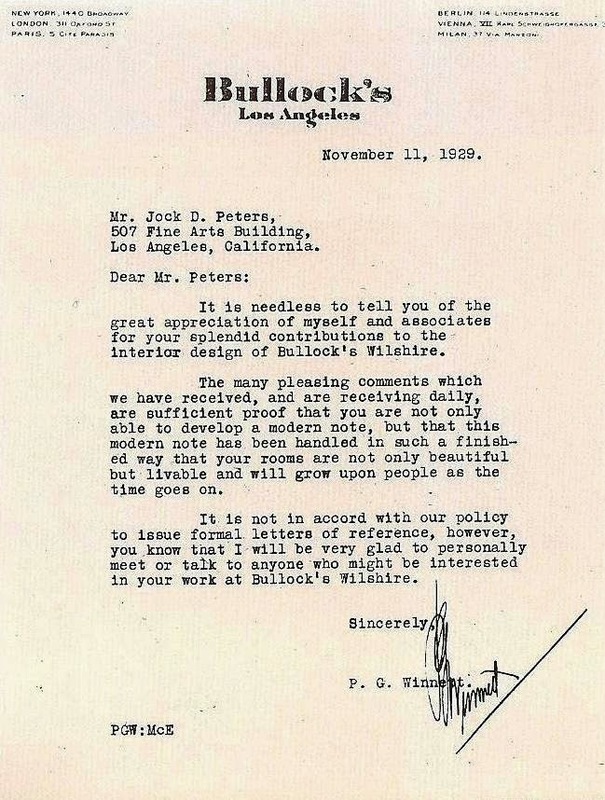 The campus exhibition apparently caused quite a stir as Scheyer wrote to Delano on Oakland Art Gallery letterhead as their "European Representative,"
"...I would also like very much to get a copy of the controversy in the University newspaper. ... I can only assure you that I had a very wonderful experience with your Art Department, and it was very much due to the "idealistic teachers", of whom you are one. My most sincere compliments to you and your friend Mrs. Barbara [Morgan]. Will you ask her if her friend the photographer [husband Willard] has taken photos of the pictures? I am very anxious to have copies. Thank you so much for your trouble, and please give my kind regards to your students." 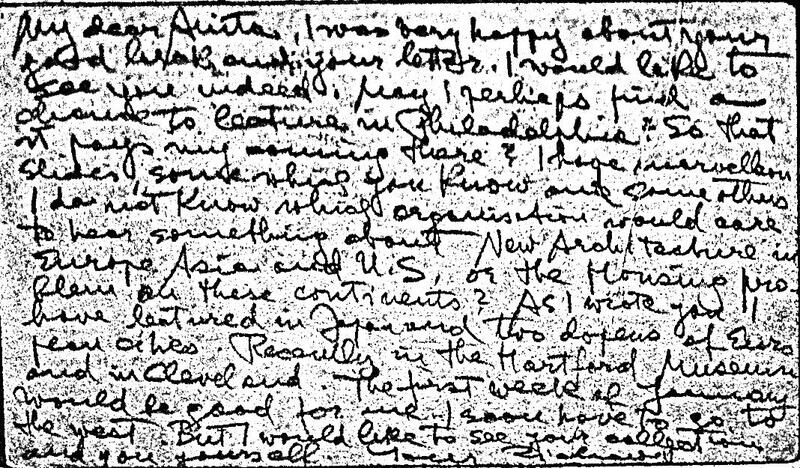 (Letter from Galka Scheyer to Annita Delano, December 13, 1926, from Archives of American Art, Annita Delano Papers, 1909-1975, microfilm roll 3000). 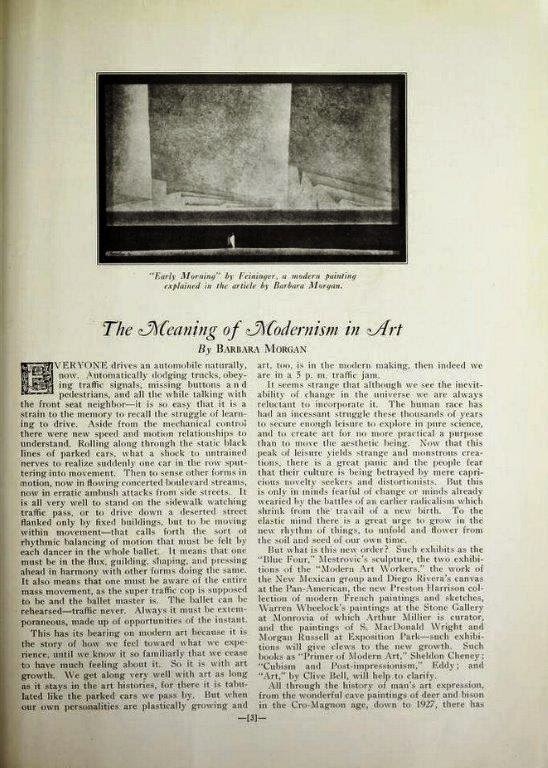 Scheyer must also have appreciated the publicity of Barbara Morgan's feature article on Lyonel Feininger and the meaning of modernism in Artland which was published shortly after the two shows came down (see below). Morgan, Barbara, "The Meaning of Modernism in Art," Artland, February 1927, pp. 3-4. Scheyer visted Los Angeles regulary during 1927 and is mentioned in Edward Weston's Daybooks as having provided him a female costume and makeup job for a party at artist friend Peter Krasnow's house. 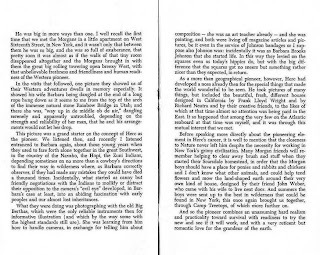 (The Daybooks of Edward Weston , Volume II: California, p. 3). Scheyer also spent three months at Kings Road during the summer of 1927 studying with R. M. Schindler the aspects of modern architecture she could apply to her art lectures while also scouting out the Los Angeles scene for potential clients and a possible change of venue. During this period she undoubtedly regularly crossed paths with Delano and the Morgans. Madam Scheyer - clever, vivacious, - with a nice line of talk for club women and art students: she has climbed all over the culture hungry! However, I don't dislike her as some of my friends do. She amuses for awhile and can be simple when she knows the futility of pose. ... but I did buy a Kandinsky lithograph, - how could I resist it at $3? Kandinsky seems to me one of the few moderns whose work will live: he has something very personal, genuine, - he has both intellectual and emotional ecstacy. This print will bring me much joy." (Daybooks , pp. 29-30). "Freedom in Creative Art Applied by Children," San Francisco Examiner, February 5, 1928. Courtesy of Getty Research Institute, Peg Weiss Papers. 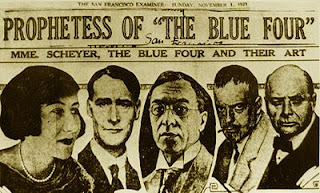 Blue Four sales never quite materialized to the point of self-support for Scheyer so she had to resort to teaching art at the Anna Head School for Girls in Berkeley beginning in 1926 and continuing until 1931. She was a talented and inspired teacher evidenced by her student's work being the subject of numerous exhibitions organized for the Oakland Art Gallery and elsewhere. With Director William H. Clapp's backing, Scheyer was selected as the American Representative of the Oakland Art Gallery to the Sixth Annual Congress for Art Education to be held in Prague in the summer of 1928 where she would speak on the success of her students at the Head School. (see above article). Delano was also chosen to represent the University of California, Southern Branch at the conference. An exhibition of student work was sent, and Annita represented the Art Department for the University. "Karl Howenstein gave a farewell party to Annita Delano, going to Europe. ... A Great bonfire followed supper, in which was burned a papier-mache figurine of ghastly form and mien, pillaged, as the story goes, from the Pot Boiler's theatre at that hour when life ebbs low." (Daybooks, pp. 60-61). (Note, Karl Howenstein and wife Edith were tenants in the Kings Road guest studio in 1922-23 after moving to Los Angeles from Chicago. Howenstein, soon became Director of the Otis Art Institute and hired Delano to teach on her off days at UCLA. For much more on this see my "The Schindlers and the Hollywood Art Association"). "I had never heard of Sullivan, although I'm sure I had seen something of his, because it looked familiar to me when I did see his work later. 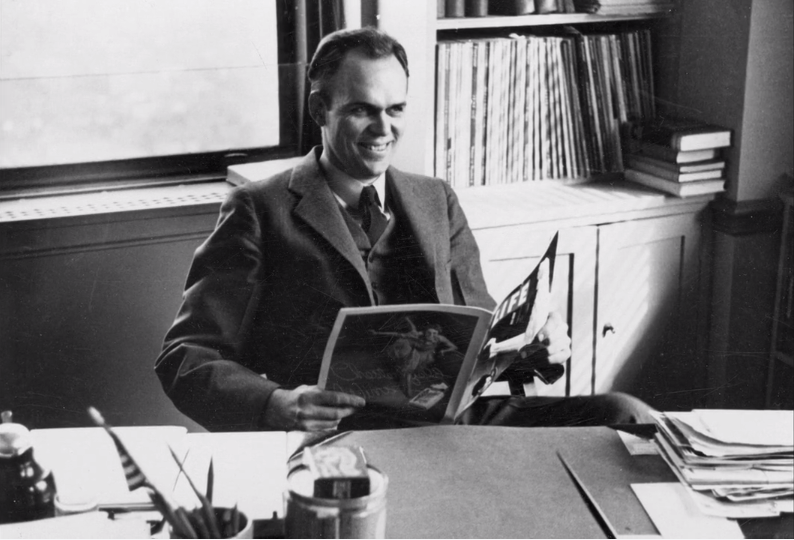 It was not until, as a student at Otis, [I] went into the office of the director on some matter or other, that Karl Howenstein shoved over a typewritten sheet for me to read. It was something he had written for a magazine, and the occasion for the writing was the death of Louis Sullivan. I read it and didn't forget it, and, less than a year afterward, [Sullivan's] The Autobiography of an Idea was published. Howenstein spoke in his piece about the influence of Sullivan. He had worked for a short time for Sullivan, but in Sullivan's much later years. He talked, I remember, in this piece for publication about the influence that Sullivan had on draftsmen in various offices. ... I did read The Autobiography of an Idea, in 1926 I guess. I was very much taken with it and became a great admirer of Sullivan." (Organic View of Design, p. 89. 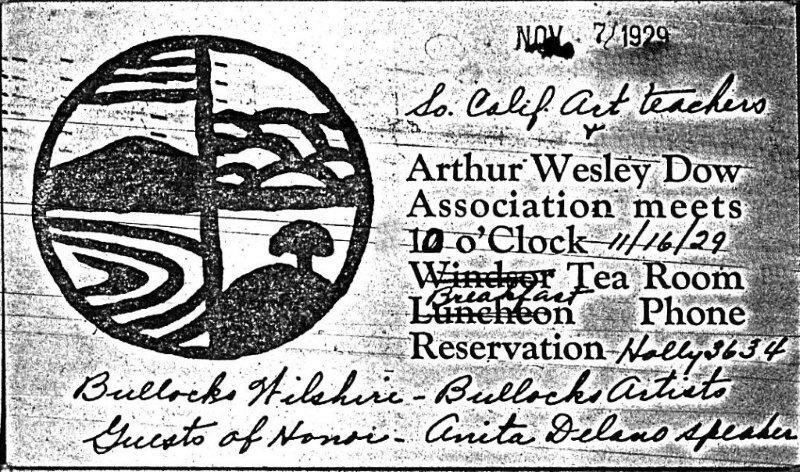 Note, Howenstein's Sullivan tribute was written about the time Neutra met Wright at Sullivan's funeral and shortly thereafter moving to Taliesin to work for Wright. For much more on this see my "R. M. Schindler and Richard Neutra and Louis Sullivan's Kindergarten Chats"). Delano and Scheyer traveled together throughout Europe during the time Richard Neutra was toiling away on the Lovell Health House plans. Delano, armed with letters of introduction from Neutra and others and many snapshots of the architectural work of Frank Lloyd Wright, Neutra and Schindler, made quite an impression at numerous informal gatherings on the West Bank in Paris, the Bauhaus, Prague, Dresden, Switzerland and elsewhere. (Delano, p. 141). 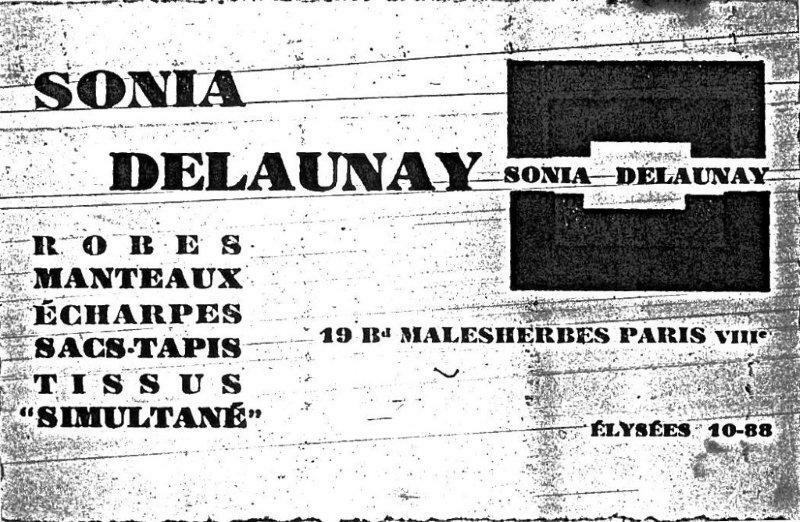 Delano met Sonia Delaunay, Marc Chagall, Albert Gleizes and others in Paris. 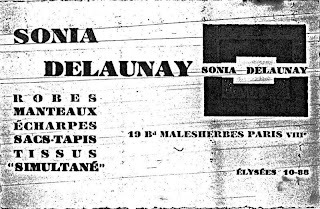 Sonia Delaunay business card, 1928. From Archives of American Art, Annita Delano Papers, 1909-1975, microfilm roll 3000. Delano was introduced to and befriended renowned Bauhaus instructors Josef and Anni Albers at the conference where Josef lectured on Exhibition Basic Design and Creative Education. After the conference, Scheyer and Delano traveled to the Bauhaus in Dessau, where they visited Jawlensky, Klee and Kandinsky in June. (see below). Scheyer returned works that she had on consignment and obtained new material to ship back to California. Galka Scheyer and Wassily Kandinsky on the terrace of the Meister house in Dessau, June 1928. (From Baumgartner, Michael and Houstian, Christina, "The Blue Four: Chronology of Events" in The Blue Four: Feininger, Jawlensky, Kandinsky, and Klee in the New World, p. 329). 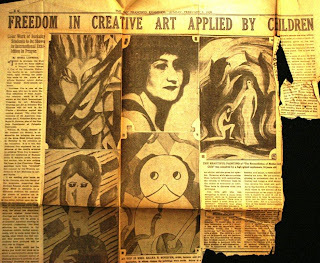 During the time Delano was attending Neutra's Academy of Modern Art class, Scheyer arranged for an exhibition of her work at the Oakland Art League in March 1929 which received front page coverage in the Los Angeles Evening Herald. (see below). "And they knew about a woman named Eleanor Lemaire because Mr. [Percy G.] Winnett, who was president of Bullock's, had traveled to New York and gotten Miss Lemaire to come out and do a job for Bullock's before 1929. That was to do with modern objects that might be sold in the store. I was hired in my off-time to help Miss Lemaire find things in Southern California because Bullock's had a policy of trying to utilize local talent. I spent all my extra days going about, taking Miss Lemaire in my car to visit modern architects and designers, and some of my own students included, who were doing things, to help them on the store. ... 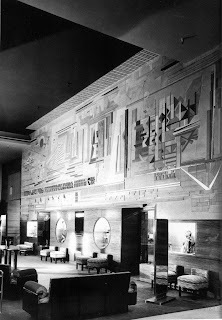 I found people for Miss Lemaire, like John Weber, who helped her do many of the rooms, [Jock] Peters for the entrance hall or lobby — whatever they called it there in the entrance. It's still good today. New carpets were designed, new draperies that went together, and new ideas where you could look through the store and look out through the windows. I really collaborated with Miss LeMaire for over a year in this work and really was a friend until she died [in 1975]." Delano introduced Lemaire to Jock Peters, John Weber, Kem Weber, Herman Sachs, Gjura Stojana, George Stanley, Eugene Maier-Krieg, and former student and talented furniture designer Paul Williams (not the architect). 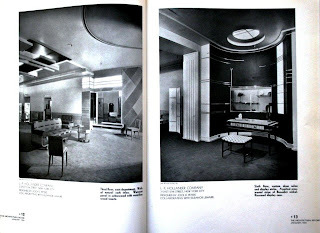 Lemaire hired them all (except Kem Weber, who was busy designing the interiors for the Sommer and Kaufmann Shoe Store in San Francisco) and immediately put them to work on various phases of the interior design work for Bullock's Wilshire discussed later below. (This essay, first posted August 26, 2010, was the source for Note 67 on page 265 of Christopher Long's Kem Weber: Designer and Architect, Yale University Press, 2014. Many thanks for architectural historian Alan Hess for bringing this to my attention.). 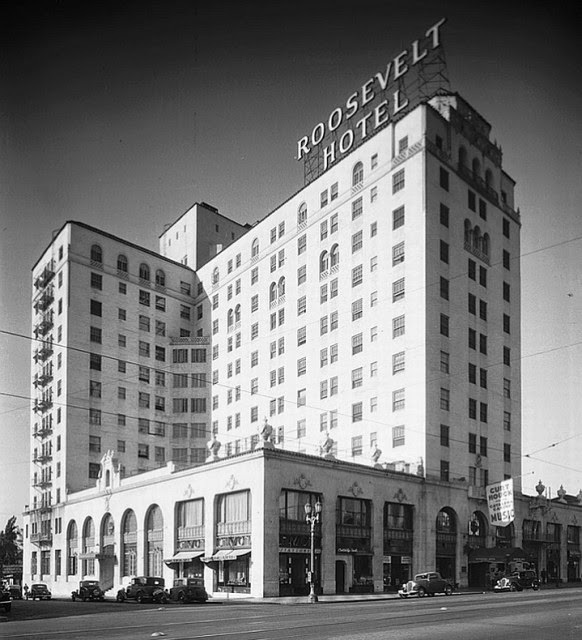 Bullock's Wilshire broke ground in November 1928, a few months after the remodeling and expansion of the downtown store was completed and the same month Neutra began work on Lovell Health House (see below). 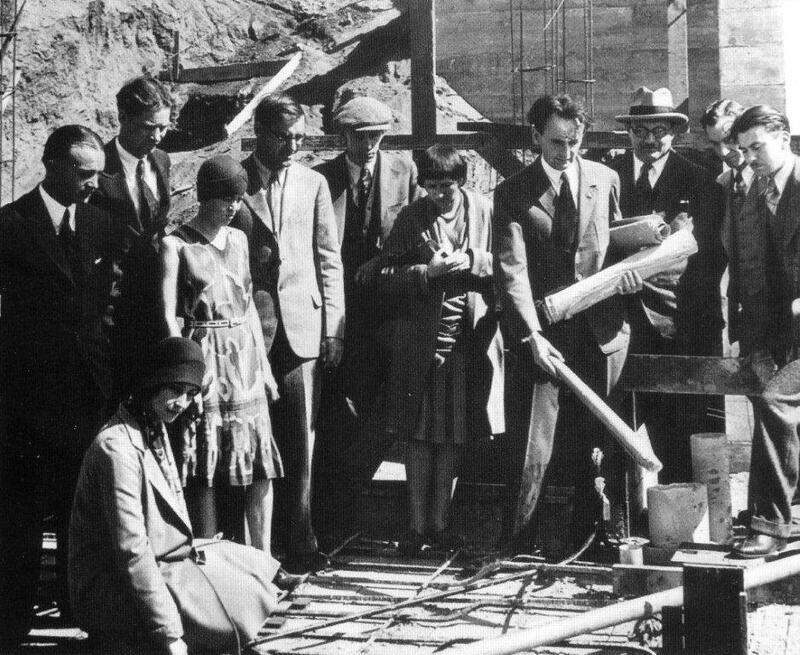 The foundation work was taking place concurrently with the Lovell foundation in the opening January 1929 photo of Neutra's class. Bullock's Wilshire foundation, January 15, 1929. Photo by Mott Studios from California State Library Photo Collection. P. G. Winnett's original motivation for hiring Lemaire, besides modernizing Bullock's downtown store, was likely to keep up with the trends toward modern merchandising being set by Macy's and others in New York and nearby local competitor Barker Brothers. Barker Brothers had hired Kem Weber in 1921 as a draftsman in their design studio. Weber, like R. M. Schindler, had come to the U.S. to work in 1914 with no intentions of remaining permanently and became trapped due to events surrounding World War I. Weber's employer, Bruno Paul sent his assistant to San Francisco to supervise work on the German pavilion being built for the Panama-Pacific International Exposition of 1915. The onset of the war prevented him from returning to Germany despite the construction of the pavilion being suspended, leaving him stranded in California. He worked at a variety of odd jobs until moving to Santa Barbara in 1919 where he opened his own design studio where he produced furniture, wood carvings, draperies, paintings and theoretical architectural drawings. Within a year after beginning at Barker Brothers, Weber became Art Director, where he remained until l927. He designed modern furniture and established the store's Modes and Manners shop in 1926 (see below) where Angelenos could purchase the latest in Art Deco and Moderne objects from Europe and the East Coast influenced by the trend-setting 1925 Exposition des Arts Decoratifs et Industriels Moderne in Paris which Weber just missed attending during a European buying trip, having to return to America just prior to the show's opening. Weber's boss Clarence Barker did, however make it the the Exposition. He liked what he saw and was convinced that Weber was on the right track with his Modes and Manners concept. Barker gave Weber the okay to design Modes and Manners in his new flagship store and a hefty raise in the bargain. (Long, p. 58). 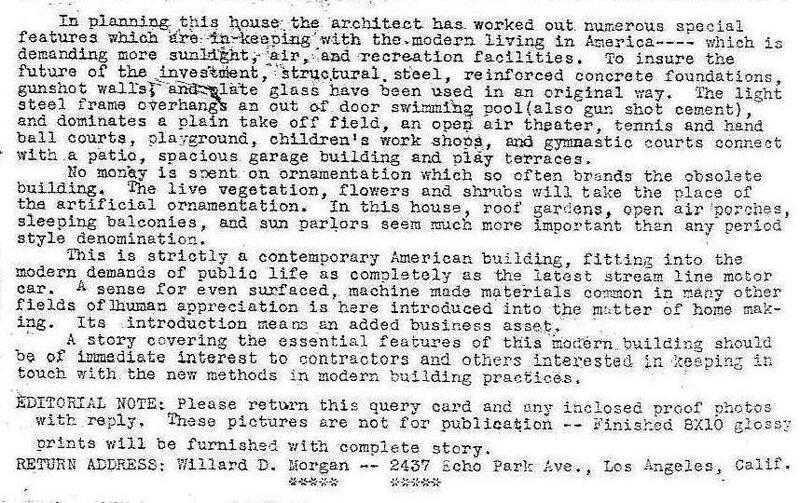 (Author's note: Weber's raise enabled hin to build his dream home in Whitley Heights in 1926. For much more on Kem Weber and Barker Brothers and Jock Peters see my "Kem Weber's Whitley Heights Enclave"). Weber befriended the Schindler's in 1921, shortly after moving to Los Angeles and going to work at Barker Brothers. He and his wife Erika were also warmly welcomed by friends from their Kings Road inner circle such as Annita Delano, Edward Weston, Henrietta Shore, Peter Krasnow, Richard Neutra, J. R. Davidson, Lloyd Wright and Paul Frankl. Modes and Manners Shop, Barker Brothers, Kem Weber, designer and manager, 1926. Courtesy UC Santa Barbara Architecture and Design Collections, Kem Weber Collection. Also see Long, p. 64. Kem Weber, Modes and Manners Shop, Barker Brothers circa 1926. 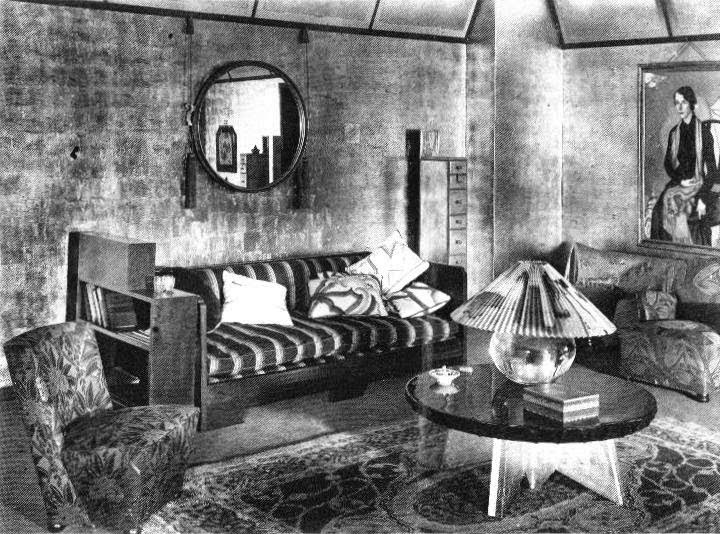 From Kem Weber: The Moderne in Southern California, 1920-1941 , bt David Gebhard and Harriett Von Breton. (From my collection). Macy's announcement featuring Kem Weber, May 1928. From Selling Good Design: Promoting the Early Modern Interior by Marilyn F. Friedman, p. 74. "Peter and Rose Krasnow, Henry Shore and I joined Erika Weber in meeting Kem, returning from New York where he furnished and decorated a three room apartment at Macy's International Exposition of Art in Industry. ﻿Peter, Henry and I were each represented in his rooms." (See piece by Peter Krasnow above the bed below). Kem Weber, living-room - bedroom design for Macy's ﻿"International Exposition of Art in Industry," May 1928. 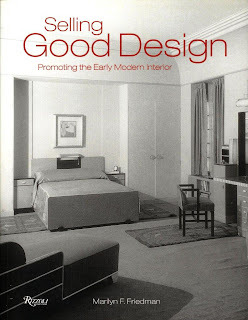 From Selling Good Design: Promoting the Early Modern Interior by Marilyn F. Friedman. Modes and Manners Shop, Barker Brothers, 1926. Kem Weber, designer. Portrait of "Lillian" by Peter Krasnow, 1925. Courtesy UC Santa Barbara Architecture and Design Collections, Kem Weber Collection. Also see Long, p. 65. "A three-room apartment designed by Kem Weber of Los Angeles and intended to serve the purposes of six rooms is the best American contribution to an exhibition of decorative art that it has been my lot to behold." "I am greatly pleased that your work, above all others, has been the most admired in the exposition." (Millier, "Californian's Furniture Wins New York Public," L.A. Times, June 10, 1928). 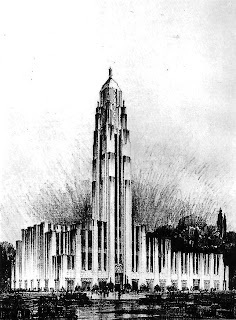 Coincidentally, one of Weber's renderings from his display in Macy's May 1928 "International Exposition of Art in Industry" appeared on the cover of the November House Planning Number of House & Garden. (See below). 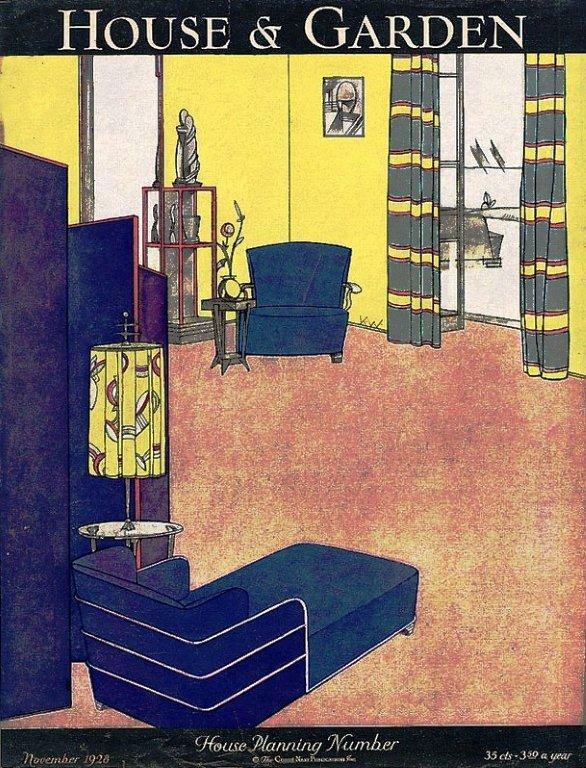 Kem Weber, living-room design for Macy's ﻿"International Exposition of Art in Industry," May 1928. House & Garden, November, 1928. American Union of Decorative Artists and Craftsmen ad listing Kem Weber at lower right, Creative Art, March 1930, pp. sup. 52-53. 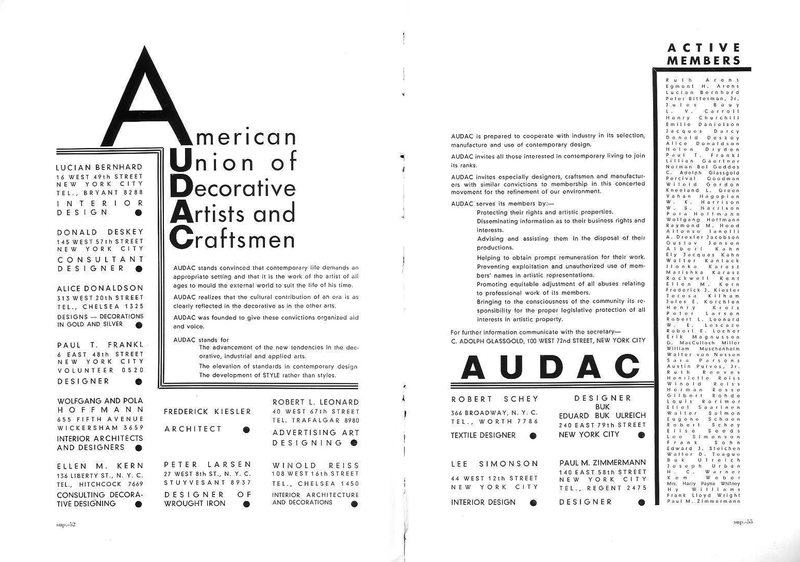 Kem Weber's success in New York in 1928 resulted in his inclusion as a charter member of the American Union of Decorative Artists and Craftsmen (AUDAC) headquartered in that city. (See above). Weber proposed the formation of a Pacific Coast Chapter to the group when he traveled to New York in July to become the first non-businessman to address a meeting of the National Retail Dry Goods Association on "The Value of Artistic Effort in Merchandizing." ("Designers Unite," L.A. Times, July 29, 1928, p. III-20). Franz Ferenz also hired Weber to lecture at his Academy of Modern Art during 1928. ("Modern Art Talks," L.A. Times, July 29, 1928, P. III-20). P. G. Winnett had hired the architectural firm of John Parkinson & Donald B. Parkinson in 1925 to design Bullock's new flagship store, Bullock's Wilshire, in an elegant style within a traditional framework﻿. 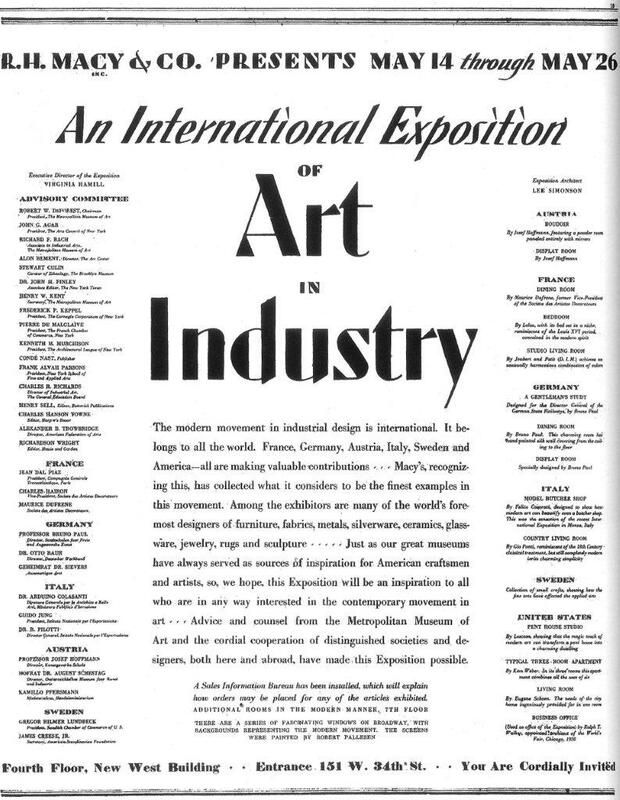 The plans were well along when Winnett and Donald Parkinson visited the 1925 Exposition des Arts Decoratifs et Industriels Moderne in Paris. 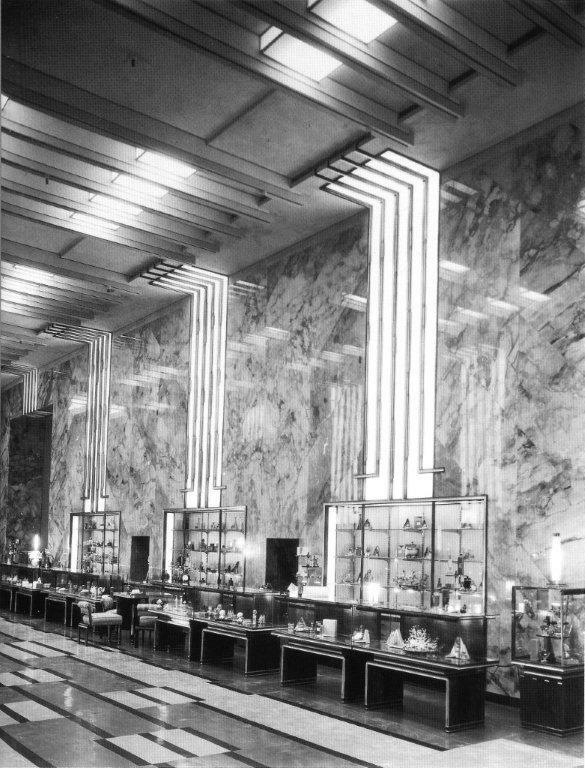 When Winnett and Parkinson returned from Paris they decided to scrap their original vision for a much more prominent Art Deco expression inspired by Los Angeles's passion for the automobile manifested in the design and decoration of the dramatic and elegant porte cochere at the rear of the store. (See Bullock's Wilshire by Margaret Leslie Davis, pp. 38-39). 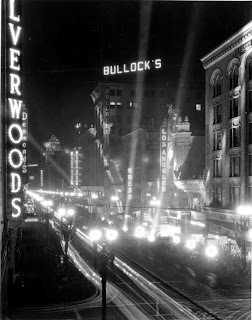 Bullock's Downtown circa 1928. Photographer unknown. Concurrent with the groundbreaking and initial phases of Bullock's Wilshire construction, Lemaire and Delano collaborated on a related exhibition "Decorative and Fine Arts of Today" (see announcement and catalog below) at the downtown store (see above) to help boost Christmas sales at the recently expanded and renovated downtown store, promote the new store then under construction and keep up with Macy's and Barker Brothers "modern" marketing efforts. Delano collected and curated the work of local artists and designers from her coterie of friends in the California Art Club including, besides herself, Kem Weber (see earlier above), Peter Krasnow, Henrietta Shore, Edward Weston, Edouard Vysekal, George Stanley, Jock Peters, Richard Neutra, R. M. Schindler, Douglas Donaldson and Frederick Monhoff, many of whom were also working on Bullock's Wilshire interiors. (For much the earlier collaboration of Schindler, Donaldson, Delano and Weber see my "The Schindlers and the Hollywood Art Association"). "Following the lead of similar exhibitions in New York and other large cities, this is in the nature of an experiment in which the local public's pulse will be felt. ... [including] fine art, craft work and architectural exhibits from those artists of Southern California who are working in the modern spirit of simple, sensitive design." 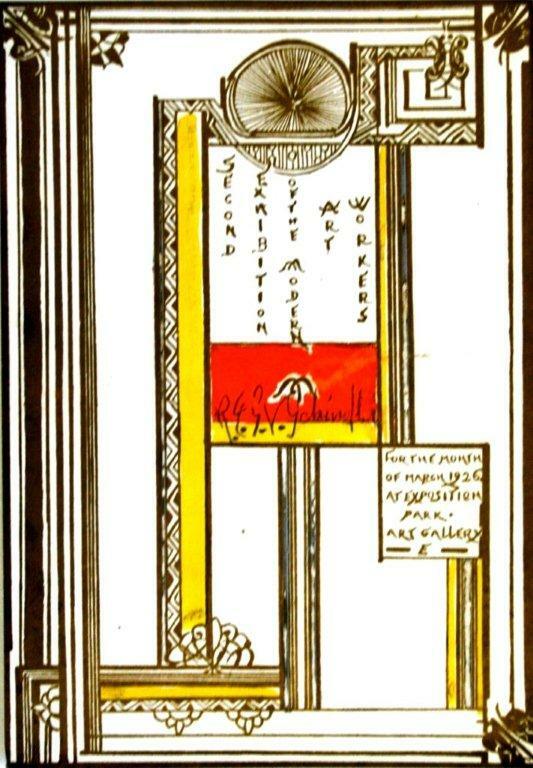 (Millier, Arthur, "Decorative Art of Today," L.A. Times, December 9, 1928, p. III-13). 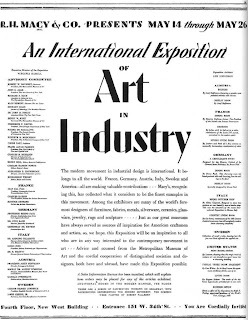 Exhibition announcement, L.A. Times, December 9, 1928, p. III-23. 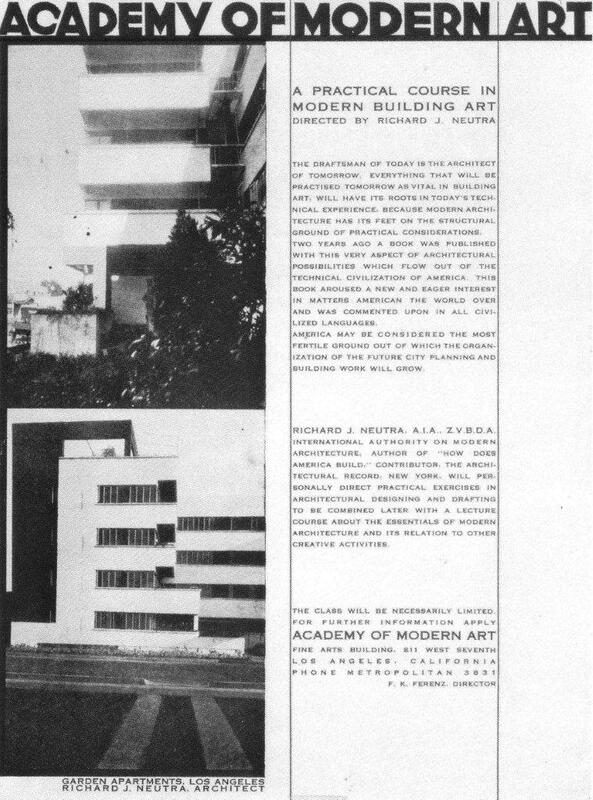 (Note: A follow-up "Modern Arts" exhibition sponsored by the Los Angeles Architectural Club, likely also curated by Delano, featured many of the same CAC members such as Kem Weber, Richard Neutra, R. M. Schindler, Conrad Buff, George Stanley, Feil & Paradise and J. R. Davidson and took place at the Architect's Building at 5th and Figueroa. ("Modern Design to be Architect's Subject," Los Angeles Times, March 18, 1929). "...and on the other side three large open alcoves devoted to modern craft work, paintings, sculpture and other arts from our own local field, which last department has been selected by Annita Delano, modern painter, craft worker and teacher from the University of California at Los Angeles. This is not, of course, the first commercial showing in Los Angeles of modern decorative art, Barker Brothers for some years having pioneered the field with their Modes and Manners Shops, and making and showing furniture designed by Kem Weber. But it is the first attempt here to put the modern movement on an art basis, to present it, not as something different, but as a genuine expression of our own time." (Millier, Arthur, "In the Southland," Argus, December 1928, p. 7). Delano included in the exhibition: 15 Edward Weston photographs, paintings, drawings and sculpture from Peter Krasnow, two or her own watercolors, eight lithographs and paintings from Henrietta Shore, Kem Weber designs for an entrance hall, dining room, bedroom and bathroom (likely the same drawings and/or photos used in the earlier-discussed Macy's exhibition), sculpture by George Stanley, silverware by Douglas Donaldson, R. M. Schindler's Wolfe House on Catalina Island (with photos by Brett Weston), Lovell Beach House in Newport Beach (with photos by Edward Weston), and 3 other projects, five interiors designed by Jock Peters, drawings and watercolors by Edouard Vysekal, architectural designs by Fred Monhoff, Richard Neutra's Rush City railroad terminal, office and store building and Metropolitan Business District and more by others. 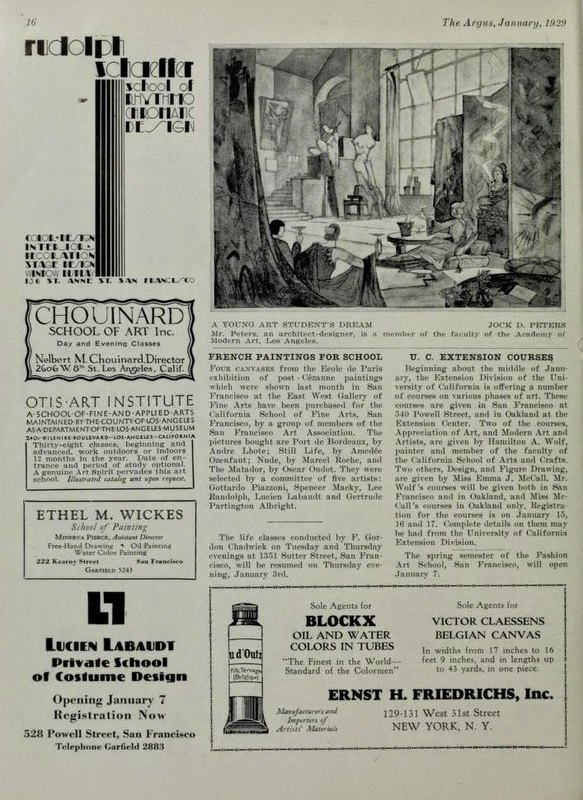 An Exposition of Decorative Arts of Today exhibition catalogue, Bullock's, December 1928. Catalogue design by Jock Peters. Courtesy of the UC-Santa Barbara, University Art Museum, Architecture and Design Collections, Jock Peters Collection. Jock Peters portrait by Brett Weston, likely commissioned by Pauline Schindler circa 1930. Courtesy of the UC-Santa Barbara, University Art Museum, Architecture and Design Collections, Jock Peters Collection. (Image discovered by archivist Melinda Gandara to whom I am indebted for sharing with me.) 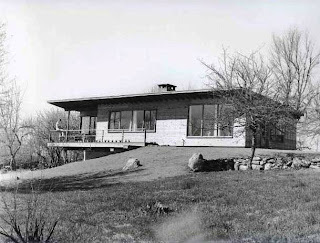 (Author's note: In a May 23, 1930 letter to his father from Frank Lloyd Wright's Storer House where he was weclomed by Pauline Schindler to set up his first solo studio after his recent move from Carmel, Brett Weston lamented that his two best prspects for work, Peters and Schindler, were both out of town. For more on this see my "Brett Weston's Smokestacks, 1927"). Jock Peters, like Kem Weber, was a German emigre who apprenticed with Peter Behrens for two years prior to World War I. He moved to Los Angeles in 1923 and found work as an architect and art director with with the Famous Players/Lasky Corporation (Paramount Pictures) between 1924 and 1927. He started his own firm with his brother called Peter Brothers Modern American Design in 1927 and the next year won a pair of first prizes in national furniture and rug design competitions. Peters' offices were located in the Fine Arts Building two floors below F. K. Ferenz's Academy of Modern Art classrooms. 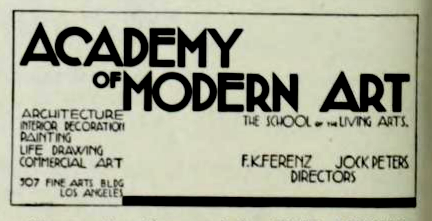 Peters was also among the star-studded faculty, with Richard Neutra and Kem Weber, of Ferenz's Academy during 1929 and was also listed as a co-director in a period ad (see below). Prescient indeed were the students such as Gregory Ain, Harwell Hamilton Harris, Barbara and Willard Morgan and Annita Delano who were wise enough to enroll in the Academy during this epochal and seminal time in the evolution of Los Angeles Modernism. "Academy of Modern Art Ad," The Argus, February 1929, p. 16. It was around this time that Lemaire commissioned Peters to design most of the first two signature floors of Bullock's Wilshire. Peters' work was also gaining much recognition in San Francisco in the pages of The Argus as seen in the below example. 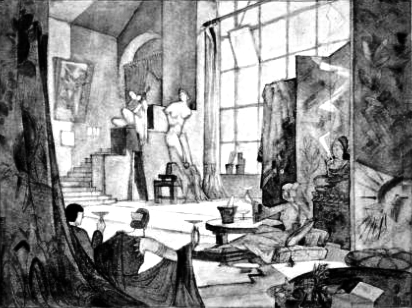 Jock D. Peters rendering "An Art Student's Dream," The Argus, January 1929, p. 16. Jock Peters, Perfume Hall, Bullock's Wilshire, 1929. From Davis, p. 53. "After the pleasure of seeing his designs projected in the materials and colors of the first three floors a Bullock's Wilshire, Jock D. Peters's original drawings for the projects, now being exhibited in the newly opened Palm Court on the first floor, take on an added interest. These drawings have an extraordinary clarity of design and treatment. Peters marshalls the abstract elements of architecture in perspective drawings that are in themselves things of beauty. In addition to the group of Bullock's drawings he shows some of those precious things that every designer cherishes - his dreams committed to paper." (Millier, Arthur, "Art Center Outlined," Los Angeles Times, October 27, 1929, p. 18). 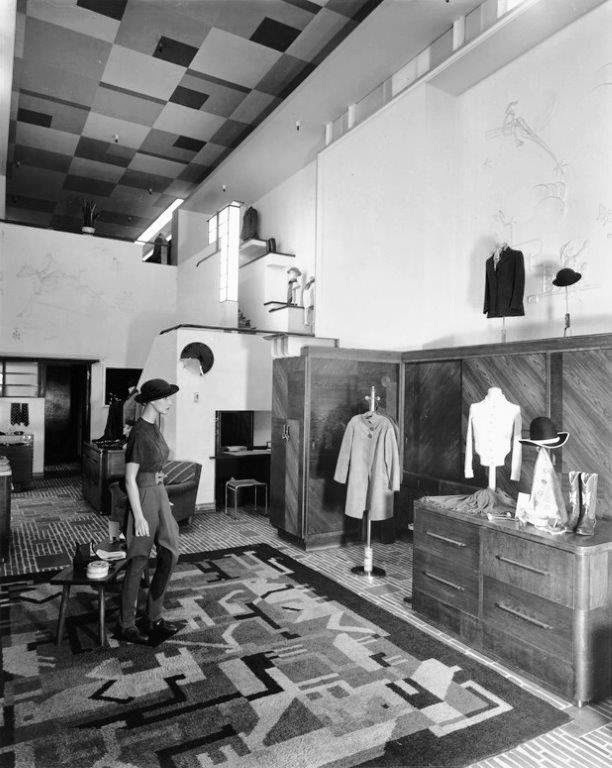 Jock Peters Saddle Shop featuring the wall plaster reliefs by Maier-Kraig, patterned rugs by Sonia Delaunay and storage cabinets possibly by former Annta Delano industrial design student Paul Williams (not the architect). Photo by Mott Studios from California State Library Photo Collection. Similar designs by Sonia Delaunay from 1929. 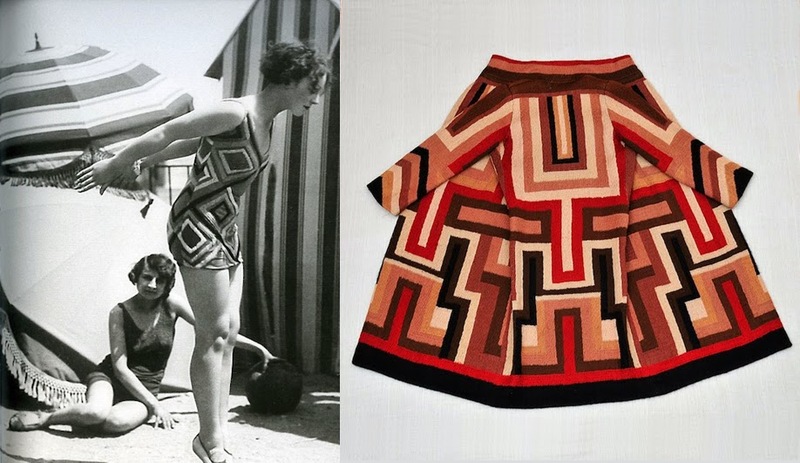 From Azure Magazine's "On Exhibit: Sonia Delaunay's Vivid Paintings and Textiles." 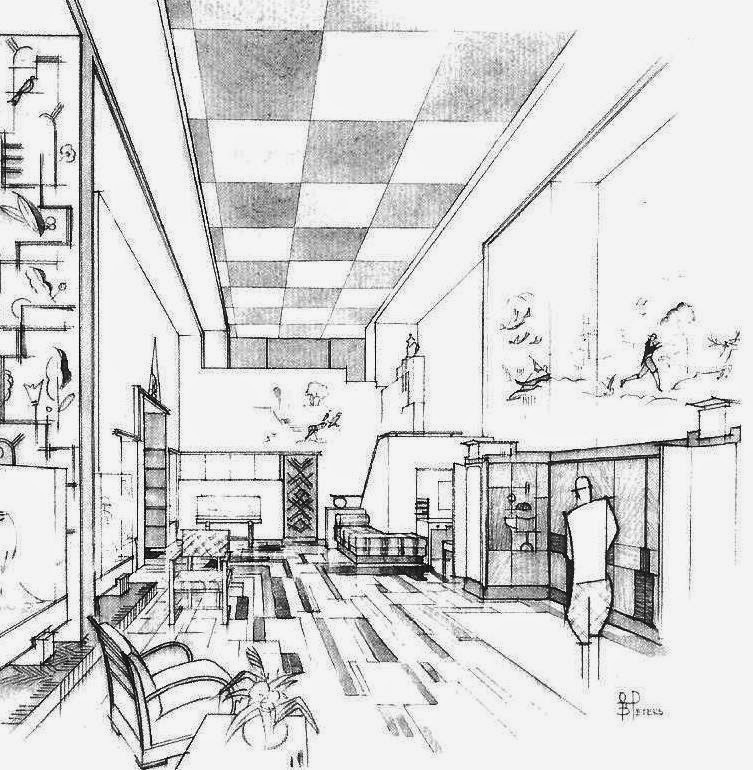 Jock Peters Rendering for Bullock's Wilshire Saddle Shop illustrating the wall plaster reliefs by Maier-Kraig and patterned rugs by Sonia Delaunay. From Davis, p. 56. 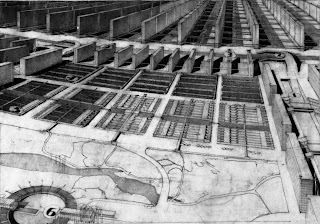 The Peters exhibit also included "sketches for a "future city," that beautiful yet horrible dream of glass and concrete that occupied architects' minds five years ago; and some remarkably clear drawings for a motion picture dealing with this same theme, which Famous Players-Lasky dropped when the German "Metropolis" appeared." (Ibid). Peters, Jock, "An Art Student's Dream," The Argus, Ianuary 1929, p. 16. "masters of the arts would exchange ideas with philosophers, authors, engineers, mathematicians; lectures attuned to such minds would be given. Artists would stay here only three months - obviously such a rarefied intellectual atmosphere would be only as a "retreat" from the actualities of the world - and should during their stay, work at their art, leaving at least one of their creations to build up the collection of contemporary art." (Ibid). P. G. Winnett to Jock D. Peters, typed letter signed, November 11, 1929. From Davis, p. 47. Gjura Stojana, 1921, Margrethe Mather and Edward Weston photo. From Margrethe Mather and Edward Weston: A Passionate Collaboration by Beth Gates Warren, Santa Barbara Museum of Art, 2001, p. 82. 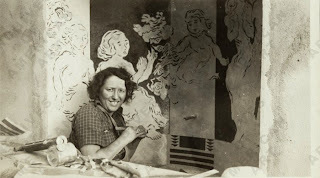 "Miss Lemaire wanted a mural somewhere, and I had introduced her to Gjura Stojana. He was a Gypsy from Rumania that I knew, or from one of those Balkan states, and a very creative person. I took Miss Lemaire to see what he was doing at the time. She hired hint to do a mural in the sports section on the first floor of Bullock's Wilshire, and it's there today and untouched, and it's just beautiful. The colors are soft and yet rich enough and contrasting enough. He had inlay, he has little glass and different kinds of metals put in, and wood; and it' a beautiful accessory to that part of the store." (Delano, p. 180). (For more on Stojana see my "The Schindlers and the Hollywood Art Association"). 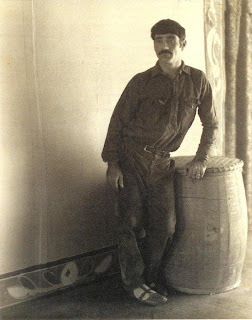 Gjura Stojana, "The Spirit of Sports," Bullock's Wilshire Sportswear Department. Photo by Willard D. Morgan, courtesy of Lael Morgan. Gjura Stojana, "The Spirit of Sports," Bullock's Wilshire Sportswear Department. From Davis, p. 54. Thanksgiving at Kings Road, 1923. Photo likely taken by Schindler. Courtesy UC-Santa Barbara Schindler collection. Herman Sachs at the far left. For the identity of the other participants see my "Herman Sachs Batiks." "In the rapidly changing styles in dress, home decoration, and in nearly all the details of modern life, there appears to be an underlying desire for beauty that finds expression in color. Yet in our architecture the life-giving quality of color is conspicuously absent. Whatever strides are made - and great advance has been made in technical construction, we cannot honestly dispute the beauty of the architecture of the ancient days when color was as dominant a factor as form." 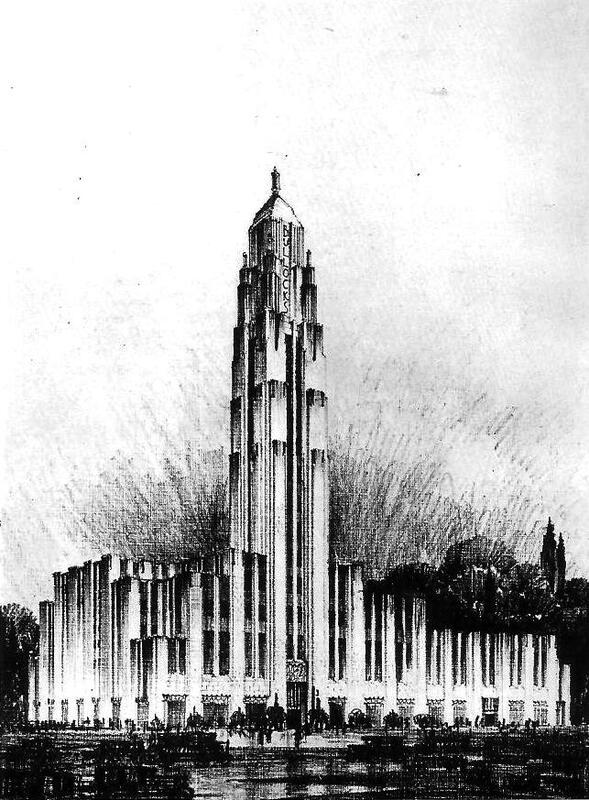 (Anderson, Anthony, "Our Architecture Declared Moribund," L.A. Times, August 26, 1923, p. III-22). Herman Sachs, "Spirit of Transportation," fresco-seco ceiling mural, Bullock's Wilshire porte cochere, 1929. Sachs had previously done interiors and art work in other Parkinson & Parkinson buildings such as the Los Angeles Gas Company Building, the Los Angeles City Hall and the Title Insurance and Trust Company Building. By the time Lemaire commissioned him for the distinctive porte cochere ceiling for Bullock's Wilshire's rear entrance he was already living in his Schindler-designed apartment building in Silverlake (see below). Herman Sachs in his apartment. Photographer and date unknown. Courtesy Stephen Clauser. 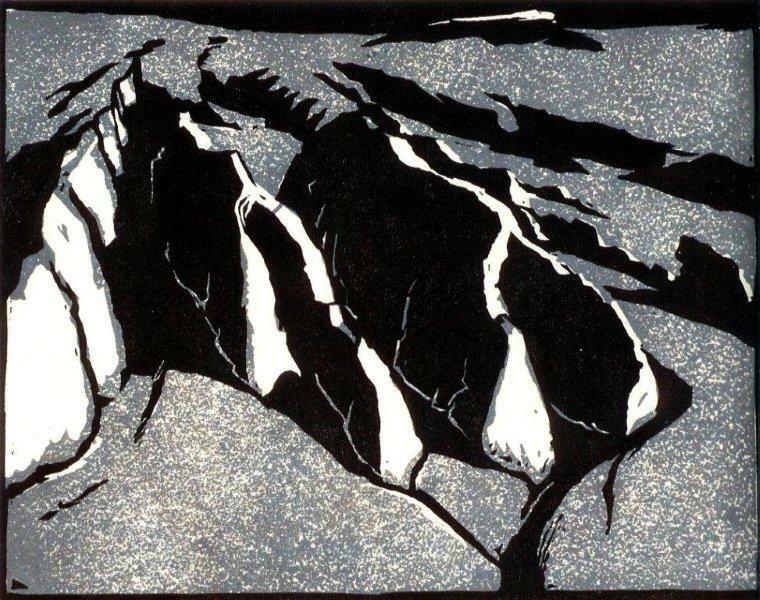 (For much more on this image see my "Herman Sachs Batik, 1920"). Sculptor Eugene Maier-Krieg, another German emigre, was hired by Lemaire to create plaster reliefs such as the hurdlers, polo players and a child riding on a comet's tail for the Saddle Shop seen below and other various locations. Maier-Krieg studied with Karl Deibele and continued at the Stuttgart Art Academy where he later became an assistant professor. He came to the U.S. in 1924 and after a short period in New York moved to Hollywood where he worked for various movie studios. He was also commissioned by Kem Weber about the same time to do similar work on the Sommer and Kaufman Shoe Store in San Francisco. ("Some New Work in California by Kem Weber," The Architectural Record, July 1930, pp. 49-59). Eugene Maier-Krieg, plaster reliefs, Saddle Shop, Bullock's Wilshire, 1929. From Davis, p. 74. 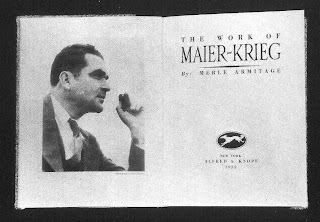 Art patron and impresario Merle Armitage would soon champion the work of Maier-Krieg as seen in the below 1932 article in California Arts & Architecture shortly before he was named to the magazine's editorial advisory board, and publication in the same year of a monograph of Maier-Krieg's work. (See further below). 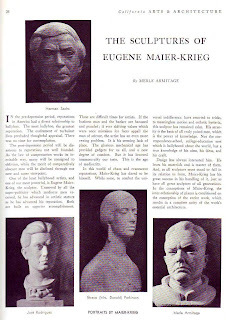 Note the busts of Armitage, Herman Sachs, and Mrs. Donald B. Parkinson in the article. (See my related The Sands of Time: The Oceano Dunes and the Westons). 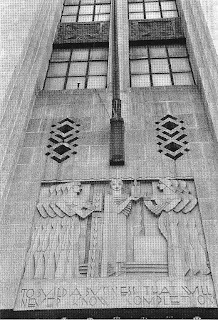 Maier-Krieg also created a bas relief sculpture for Parkinson & Parkinson's Title Gaurantee Building in 1930. 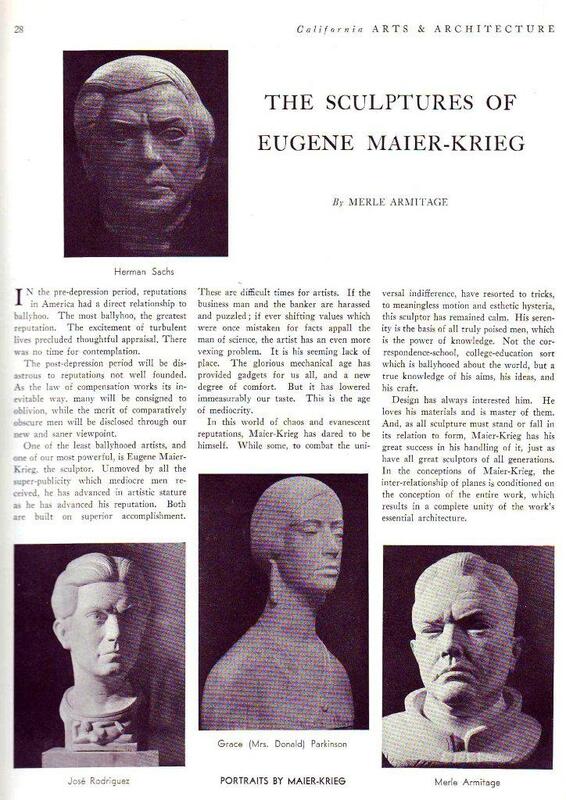 Armitage, Merle, "The Sculptures of Eugene Maier-Krieg," California Arts & Architecture, 1932. Brett Weston, "Eugene Maier-Krieg frontispiece portrait, 1932" The Work of Maier-Krieg by Merle Armitage, 1932. (From Designed Books by Merle Armitage, E. Weyhe, New York, 1938, p. 97). (From my collection). 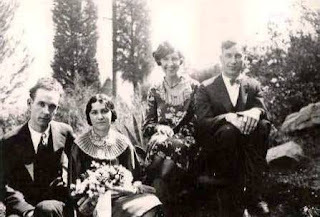 The Stanley wedding, from left, George Stanley, Kathleen Cotton, unknown and Harwell Hamilton Harris October 16, 1926. From Otis Collections Online. Otis Art Institute graduate and later sculpture instructor George Stanley (seen in the earlier 1924 Otis sculpture class photo and above) was commissioned by Lemaire through Delano to create the terra cotta bas relief panel above the Wilshire Blvd. entrance seen below. 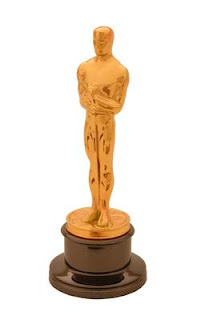 Stanley was also commissioned the same year by Cedric Gibbons to design the Oscar statuette for the Academy of Motion Picture Arts and Sciences, was first presented at the inaugural annual Academy Awards banquet held at the Hotel Roosevelt in Hollywood on May 16, 1929. Stanley was asked to stand for applause at the ceremony in recognition of his contribution. (Anniversary and Awards Bulletin, Academy of Motion Picture Arts and Sciences, Bulletin No. 22, June 3, 1929, p. 4). Inaugural Academy Awards ceremony, Blossom Room, Hollywood Roosevelt Hotel, May 16, 1929. From Academy website. "The prize or trophy to be presented to the winners of the fifteen First Awards has been pronounced by all competent artists who have seen it, a work of artistic merit, that any winner will be proud to cherish. It is a statuette in bronze and gold designed by George Stanley, sculptor, with the approval and selection of Cedric Gibbons, chief art director of M.-G.-M. The statuette is about twelve inches high with a Belgium marble base. It consists of an idealized male figure standing on a representation of a reel of motion picture film." (Academy of Motion Picture Arts and Sciences, Bulletin No. 19, February 23, 1929, p. 2). 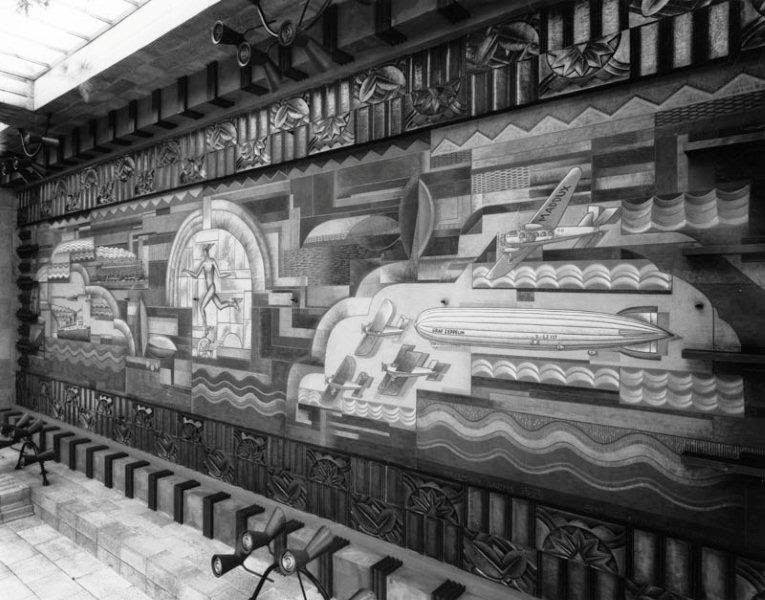 George Stanley, bas relief panel, Bullock's Wilshire, 1929. From Davis, p. 72. 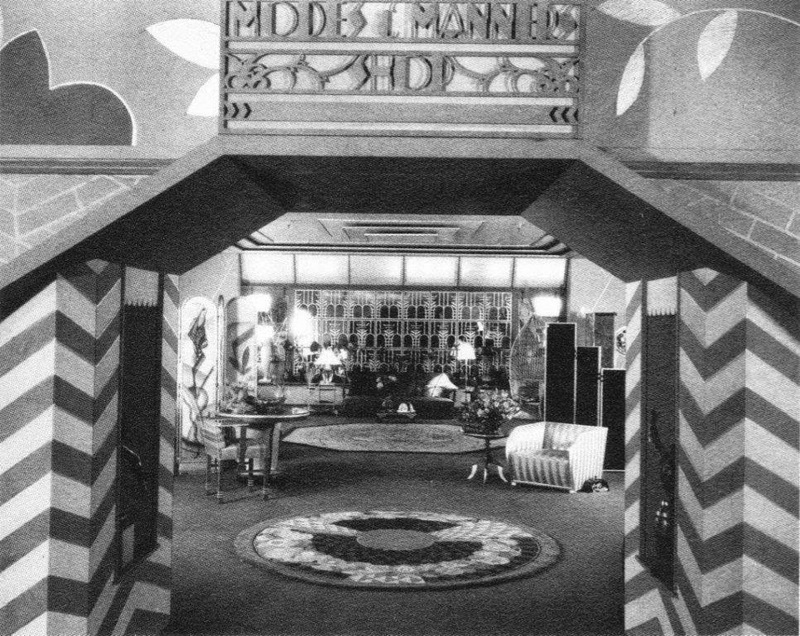 Delano was a lifelong friend of architect John Weber, a Swiss emigre and later to become a longtime employee of Lemaire and Associates headquartered in New York and designer of the Swiss Pavilion at the 1939 New York World's Fair, who was commissioned to design the public spaces on the fifth floor including the below Tea Room and Beauty Parlor. John Weber, Tea Room, Bullock's Wilshire, 1929. Photo by Mott Studios from California State Library Photo Collection. 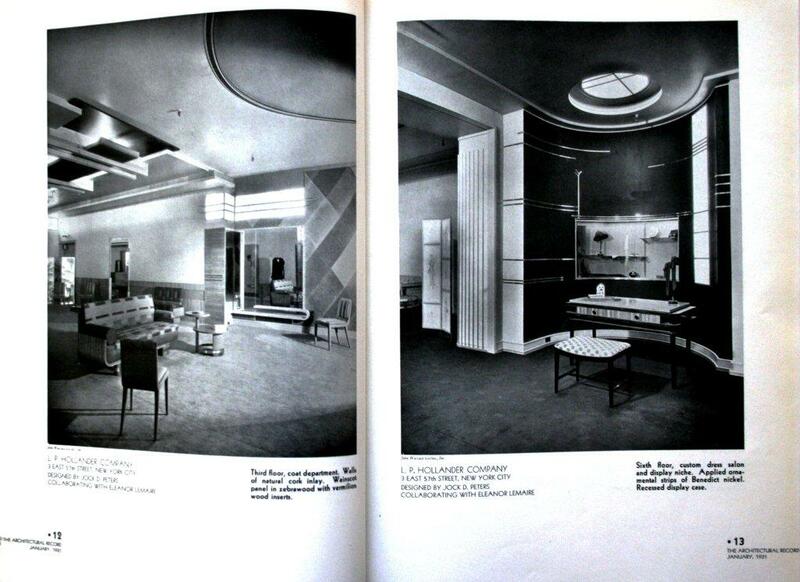 John Weber and Eleanor Lemaire, Salon of Beauty, Bullock's Wilshire, Architectural Record, December 1930, p. 463. John Weber's client, Dr. H. F. Rey, commissioned Delano to create the below mural for his new house in Oxnard, CA. 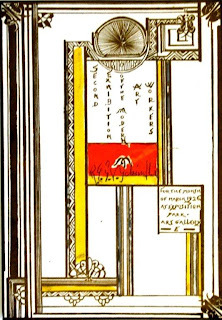 Annita Delano, Graffito mural 4' x 7' for Dr. H.F. Rey- House in Oxnard, California, John R. Weber, Architect. New York, 1937. 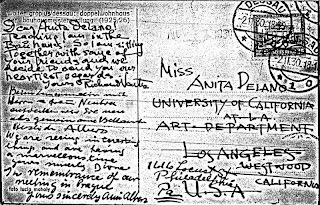 Annita Delano Papers, Archives of American Art. "All the arts connected with building in Los Angeles are experiencing a new thrill of mutual activity. As important new buildings are planned architects are turning more and more to the sculptor and mural painter for fitting decoration." He singled out the work under way by Gjura Stojana, George Stanley, Jock Peters and John Weber at John & Donald B. Parkinson's Bullock's Wilshire. (Millier, Arthur, "Arts Working Together," L.A. Times, June 2, 1929, p. 18). New York and Macy's seemed to have about a year's head start on Bullock's, Barker Brothers and Los Angeles in terms of marketing Art Deco, Moderne and Modernist objects for interior design. (See much on Macy's and other New York stores' efforts in Friedman). With the completion of Bullock's Wilshire, however, Los Angeles captured the lead in terms of the latest in department store and modern merchandising design. 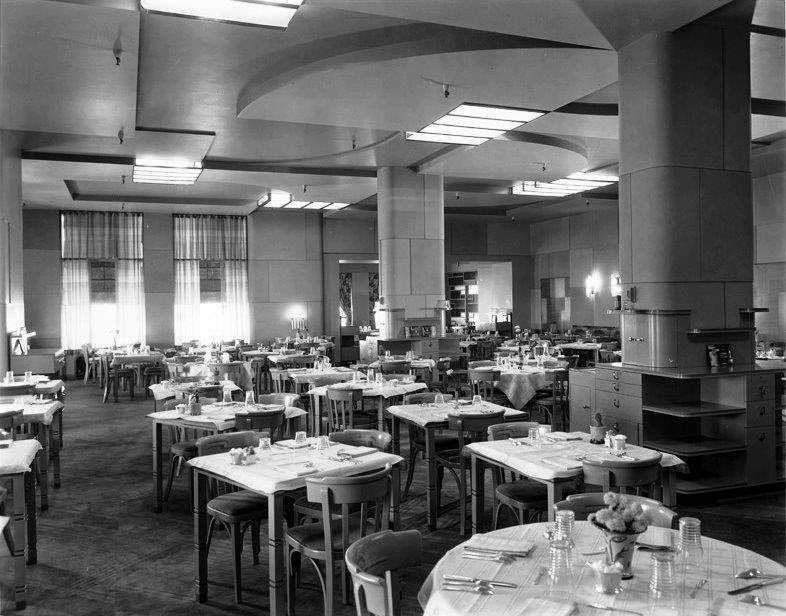 Bullock's Wilshire and the design team created by Delano and Lemaire had clearly raised the bar in the design of modern commercial interiors. "Miss Annita Delano introduced the guests of honor, Miss Eleanor Lemaire, directing artist for Bullock's, Jock Peters, [Gjura] Stojana, John Weber, David Collins, Herman Sachs, George De Winter, George Stanley, [Eugene] Maier-Krieg, and Paul Williams." ("Artists Honored," L.A. Times, November 17, 1929, p. 16). Announcement for breakfast honoring Bullock's Wilshire Artists. From Archives of American Art, Annita Delano Papers, 1909-1975, microfilm roll 3000). 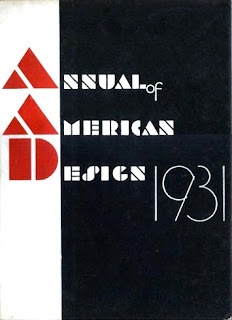 West Coast designers were certainly making a huge splash in the New York-based design and architectural journals such as Architectural Record and Creative Art as well as the New York Times in the late 1920s and early 1930s. 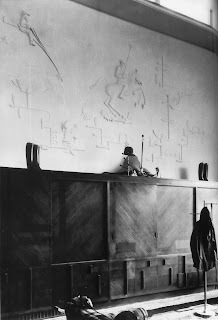 Between 1928 and 1932, work by Neutra, Schindler, J. R. Davidson, Kem Weber, Jock Peters, Lloyd Wright, John Weber and Eleanor Lemaire were featured in over 25 articles in the above publications illustrated mostly by the photos of Willard Morgan, but also Edward and Brett Weston and others. This was likely a coordinated combination of submittals by Weber, Neutra, the Schindlers and the Morgan's who quickly established a life-long friendship with upstairs building neighbor, Douglas Haskell, assistant editor at both Creative Art beginning in 1927 and Architectural Record under A. Lawrence Kocher beginning in 1929, after their move to New York in the summer of 1930. The resultant publicity led to the inclusion of members of this group into numerous seminal exhibitions in the Big Apple mentioned elsewhere herein. (See also PGS and Richard Neutra and the California Art Club for more related context). Excerpt from "A Friend's Remembrance" by Douglas Haskell in "Willard D. Morgan, May 30, 1900 - September 18, 1967." I am deeply indebted to Willard and Barbara Morgan's granddaughter Lael Morgan, trustee of the Morgan Archive for this excerpt. "L. P. Hollander Company Store, Jock D. Peters, Designer Collaborating with Eleaanor Lemaire," Architectural Record, January 1931, pp. 2-15. Upon completion of Bullock's Wilshire, Lemaire, John Weber and Jock Peters instantly landed plumb design contracts in New York for the L. P. Hollander Company Store (see above). Coincidentally, Annita Delano, in New York to visit Barbara Morgan and view the about-to-open Hollander's during her internship at the Barnes Foundation, was commissioned on the spot along with Morgan to paint a mural for Hollander's after running into a harried John Weber in the hallway. Delano and Morgan worked throughout the night to complete the mural before the next day's opening (see design sketch below). 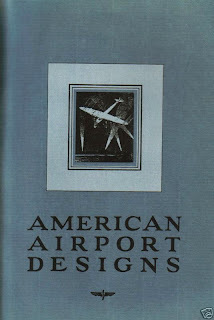 (See also Delano, p. 250 and Richard Neutra and the California Art Club for more details). Mural Design for fifth floor of Hollander's Department Store. Designed by Barbara Morgan and Annita Delano, September 23, 1930 and completed the next day. Courtesy of Lael Morgan, Morgan Archive. Kem Weber was working in San Francisco on the Sommer & Kaufmann Shoe Store the same time Bullock's Wilshire was under construction. 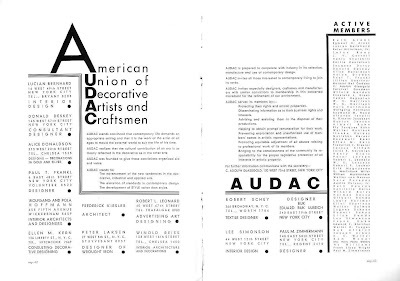 Weber was already well-respected on the East Coast through his participation in the Macy's 1928 Exposition and his active membership in the American Union of Decorative Arts and Craftsmen (AUDAC) His work also prominently featured in the 1931 AUDAC exhibition at the Brooklyn Museum which was published in the Annual of American Design 1931 (see below) along with that of fellow Angelenos J. R. Davidson, Jock Peters, Lloyd Wright and Will Connell. Work by these same particiapants had also just been shown in the Architectural League of New York's 50th anniversary exhibition at the Grand Central Palace the previous month. (For more on this ee also my Richard Neutra and the California Art Club). Annual of American Design 1931 , by AUDAC. Bullock's Wilshire and Neutra's Lovell Health House were completed about the same time in late 1929. (See below). Both made quite a splash both in the local press and nationally and internationally and in their own way put Los Angeles on the map as a world class city, especially in light of the City's upcoming hosting of the 1932 Summer Olympic Games during which these two architectural icons were mentioned as must see stops for visiting tourists. 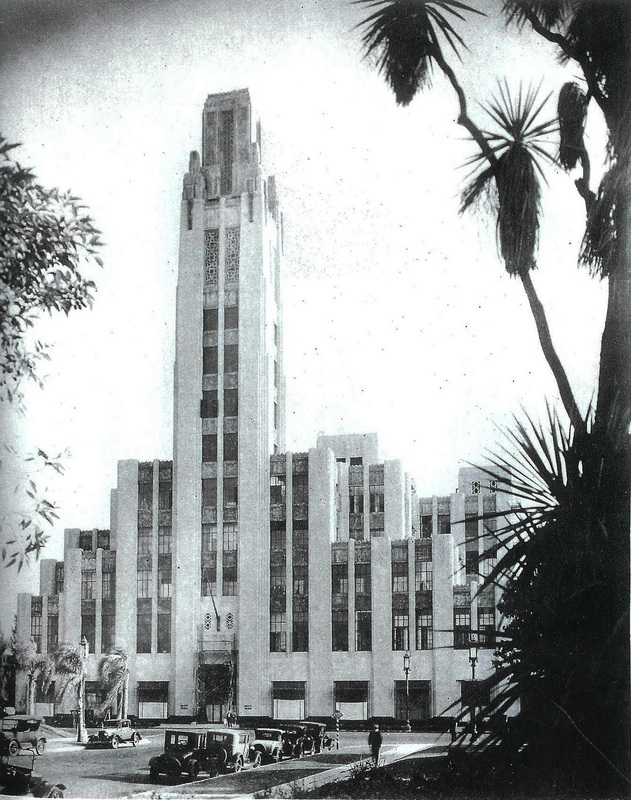 "Bullock's Wilshire Department Store, Los Angeles, John and Donald B. Parkinson, Architects," The Architectural Record, January 1930, pp. 51-61. Mott Studios photo. "Bullock's Wilshire Department Store, Los Angeles, John and Donald B. Parkinson, Architects, 1929. Photo by Willard D. Morgan, ca. 1929.Courtesy Lael Morgan, Morgan Archive. 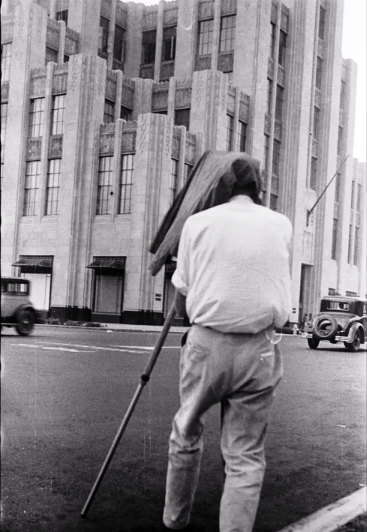 "Bullock's Wilshire is a significant contribution to the culture of our generation. It will affect a revolutionary development in taste in Southern California, which will eventually penetrate to our more conservative north, and will strongly modify the development of architecture. It constitutes an unmistakable advance in the movement of contemporary design. Much of its effect is due to color and light; and it must actually be seen for its artistic significance to be realized. Not one or two, but a number of different persons worked together in creating this extended and complicated series of compositions, which constitutes a small village of specialty shops." 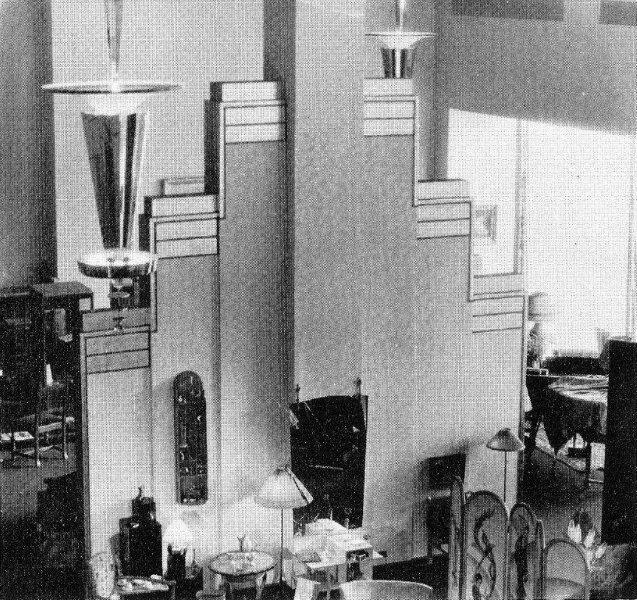 ("A Significant Contribution to Culture: The Interior of a Great California Store as an Interpretation of Modern Life," California Arts & Architecture, January 1930. See also "Pauline Gibling Schindler: Vagabond Agent for Modernism, 1927-1936"). Lovell Health House, Richard Neutra, 1929. "Care of the Body: The House Built for Health," L.A. Times, December 15, 1929, pp. VI-26-27. Willard D. Morgan photos. From ProQuest. 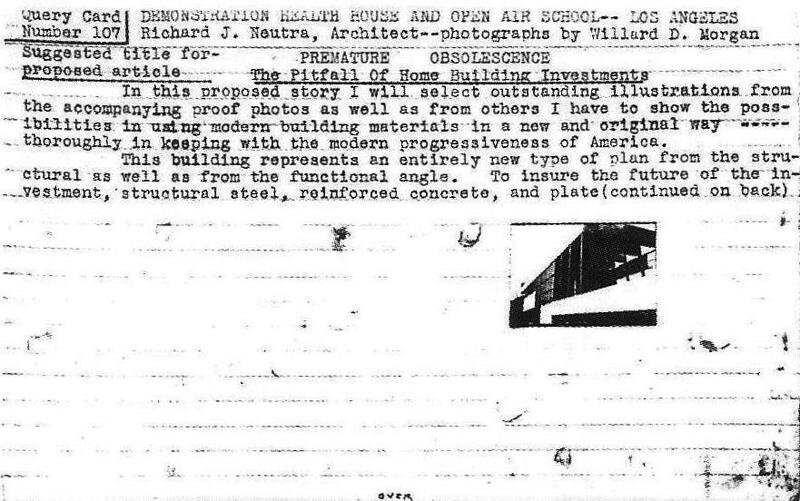 Dr. Philip Lovell, eager to show off his new "Home Built for Health," described it in detail in the above December 1929 L.A. Times article and announced that Neutra would be conducting tours to anyone interested in viewing the house over the next two weekends. Neutra was soon off on his world tour a few months after completion of the Health House beginning the sojourn in Japan before arriving in Europe later in 1930. 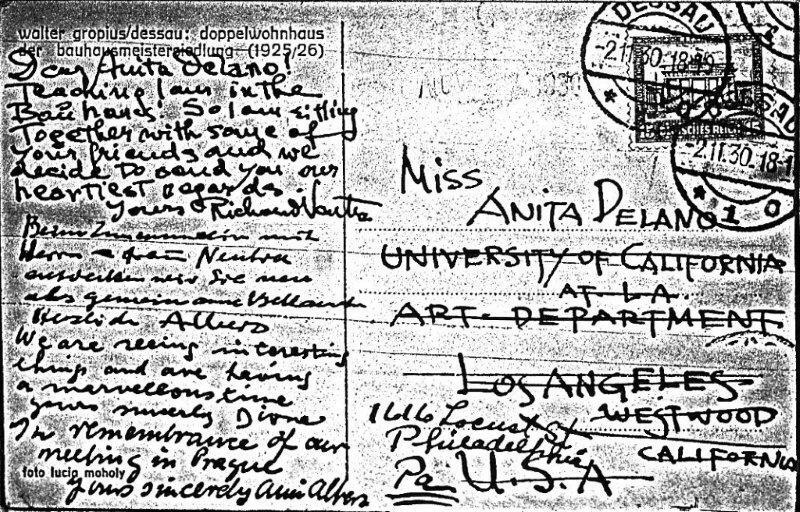 Neutra wrote from the Bauhaus (see the below postcard) to Annita Delano, who was by this time ensconced at the Barnes Foundation for two years of study, seeking possible speaking engagements on his way back home to Los Angeles. (Note: Neutra was teaching an architecture class at the invitation of Bauhaus director Mies van der Rohe, whom he met after one of his tour lectures). Note on the front of the card personal messages from Dione and Richard Neutra and Josef and Anni Albers whom she had met during the summer of 1928 while in Prague and at the Bauhaus with Galka Scheyer. The Morgan's also visited Delano at the Barnes Foundation soon thereafter during which time Willard photographed much of the artwork. Albert Barnes later wrote to Delano commending the quality Willard's work photographing the collection. 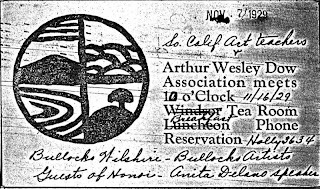 Postcard from Richard Neutra to Annita Delano, November 1930.From Archives of American Art, Annita Delano Papers, 1909-1975, microfilm roll 3000). 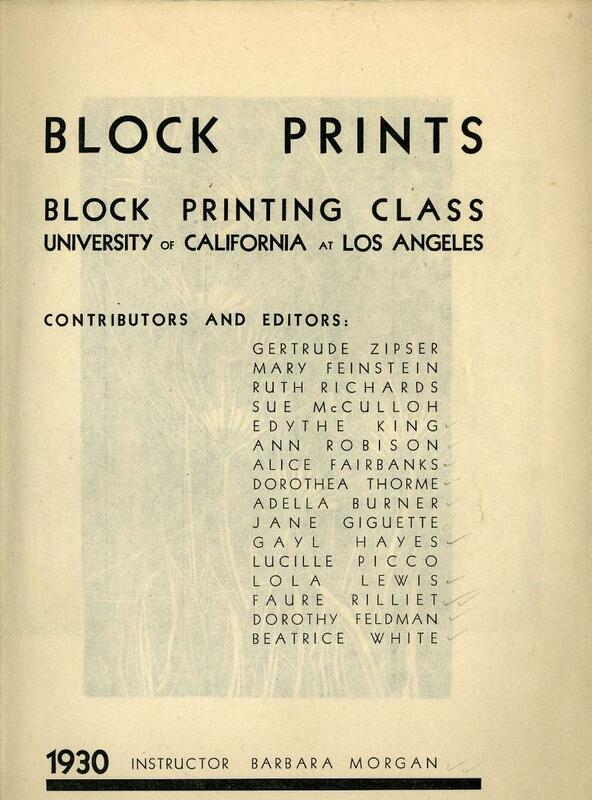 "Block Prints" exhibition catalogue, Barbara Morgan's class, UCLA, 1930. Courtesy Michael Dawson Books. Willard and Barbara Morgan (see above) were also prominent members in the Schindler, Weston, Neutra, Delano, and Freeman circles. Barbara, as mentioned earlier, was close friends with fellow art teacher Delano. Barbara Brooks Johnson married Willard D. Morgan in 1925, the year she joined the faculty at UCLA where she taught design, landscape, puppetry, and woodcut (see above). Barbara's work exhibited widely in group shows with Delano and other modernists in Los Angeles in the late 1920s. She served as writer, managing editor, and editor for Dark and Light Magazine published by UCLA's Arthur Wesley Dow Association. 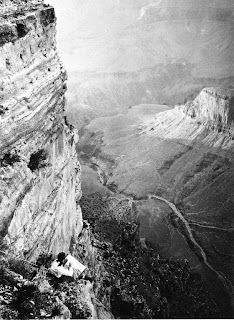 She painted and photographed in the Southwest with Willard and Delano in the summers (see below). 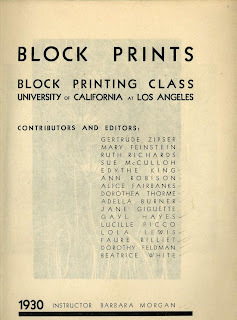 (Barbara learned the techniques of block printing under UC-Southern Branch art teacher Franz Geritz who taught from 1922-1932. 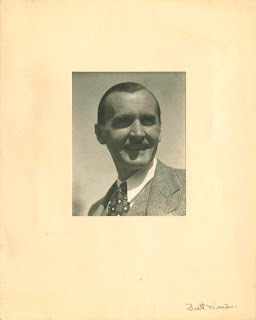 For much more on mutual Schindler-Weston friend Geritz see my "Schindler-Weston-Franz Geritz-Arthur Millier Connections"). 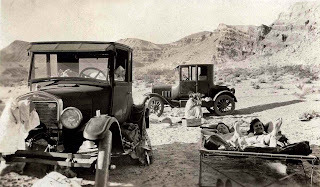 Barbara Morgan, rear, and Annita Delano and friend on cot in foreground on a camping trip in the Southwest ca. 1928. Photo by Willard D. Morgan courtesy of Lael Morgan. Willard D. Morgan, "Barbara Morgan sketching in Grand Canyon," 1928.From Barbara Morgan: Prints, Drawings, Watercolors & Photographs , by Curtis L. Carter and William C. Agee, Patrick & Beatrice Haggerty Museum of Art, Marquette University, 1988, p. 6. Barbara Morgan, "Willard D. Morgan with Model A Leica in Bandolier National Monument," 1928. 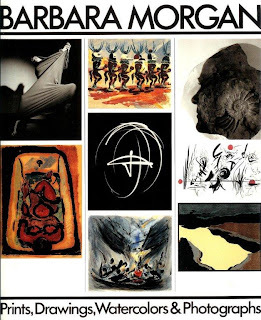 From Barbara Morgan: Prints, Drawings, Watercolors & Photographs , by Curtis L. Carter and William C. Agee, Patrick & Beatrice Haggerty Museum of Art, Marquette University, 1988, p. 9. Barbara met Edward Weston through the Schindler Kings Road circle and co-curated an exhibition of his work at UC-Southern Branch with Delano in 1928. Greatly influenced by his work she began experimenting in photography in 1930, just before she and Willard left Los Angeles for New York. ("Faces of Modern Dance: Barbara Morgan Photography, p. 5). In a 1926 article Morgan wrote, "Modern art, when it is at its liveliest, is a movement of discovery of the new beauties and new poignancies of our own age and of all ages as the quick, not the dead, we owe ourselves the creator's thrill of leaping into this search." (Morgan, Barbara, "Modern Art," Los Angeles Sun Times, June 13, 1926, Part III, p. 31). 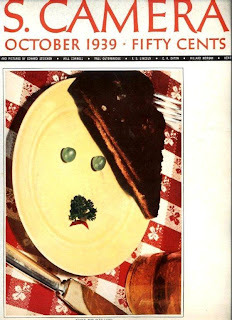 Arthur Millier, in a review of the 1927 annual California Water Color Society exhibit which included work by both Delano and Morgan wrote, "Even Paris is with us for Annita Delano has done a Marc Chagall in her "Green Tables." Elsewhere she and Barbara Morgan toy rhythmically with the Freudian symbols in "Red Horses" and "Black Cows." (Millier, Arthur, "Water -Color Society at Public Library," L.A. Times, May 1, 1927, p. 36). "One of the finest sets of prints in the show is that by Barbara Morgan, and these chance also to be the most abstract works here. ... Miss Morgan serves it with an esthetic sauce that is not produced in a casual kitchen. So abstract has she become that we see her taking hints from Kandinsky, arch abstractionist of them all." He then goes on to mention her "Eroded Lava" seen below. (Millier, Arthur, "Painters and Printfolk," L.A. Times, December 1, 1929, p. 21). Barbara Morgan, "Eroded Lava," 1929. From Barbara Morgan: Prints, Drawings, Watercolors & Photographs , by Curtis L. Carter and William C. Agee, Patrick & Beatrice Haggerty Museum of Art, Marquette University, 1988, p. 34. 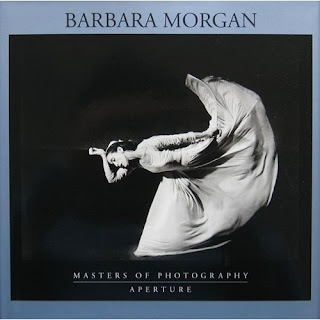 Barbara Morgan, (Aperture Masters of Photography) by Deba P. Patnaik. Barbara Morgan became renowned for her dance photography of the late 1930s and 1940s, especially her work with Martha Graham seen on the cover above. She later moved into photomontage and gravitated back into drawings and water colors late in her career. A major retrospective of her career was held at the Patrick & Beatrice Haggerty Museum of Art at Marquette University in 1988. (see below). Barbara's husband, Willard D. Morgan, had been collaborating with Richard Neutra at least since 1927 when he photographed Neutra's Jardinette Apartments, the Lovell Physical Health Center and a small project for the entrance for artist Conrad Buff's studio. 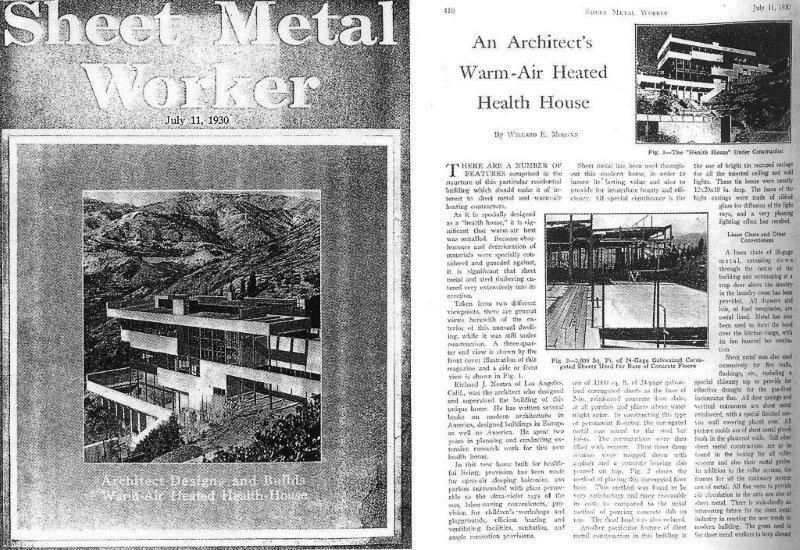 Neutra published these projects and the Lovell Health House widely in Europe and the U.S. and included them in his 1930 book Amerika (seen earlier herein) along with many Morgan photos of work by Frank Lloyd Wright, Irving Gill and others and photos by Brett and Edward Weston. 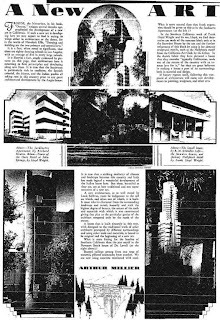 Morgan also had published under his own byline many articles featuring photos of and references to Neutra's work including a series on Neutra's conceptual drive-in markets. 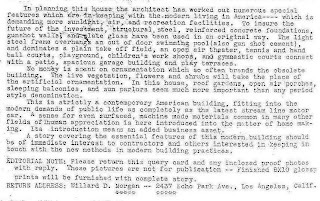 Below is an example of a typical query card Morgan sent to editors to solicit their interest in articles pertaining to Neutra's projects and further below an example of an article with Morgan's byline on Neutra's Lovell Health House. From 1927 until the fall of 1930 when the Morgans moved to New York, the pair collaborated on over 50 articles under both of their bylines. 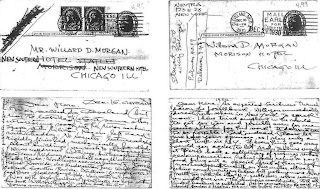 Willard D. Morgan, Query Card No. 107, "Demonstration Health House and Open Air School, Los Angeles, Richard J. Neitra, Architect, photographs by Willard D. Morgan," 1929. From Picnic de Pioneros by Ruben Alcolea, BTC, 2009, p. 268. Morgan, Willard D., "An Architect's Warm-Air Heated Health House," Sheet Metal Worker, July 31, 1930, cover, pp. 420-421, Morgan photos. From Picnic de Pioneros by Ruben Alcolea, BTC, 2009, p. 266. “As anticipated, Scribner’s has not accepted the proposal for Lovell Book. Could you tell me with who I could speak now in New York? I tried everything in the world to get for you and possibly even for me some return for this work. It doesn’t seem possible. Sad indeed. Please let me have your opinions as I stay only a short time in New York. If everything goes wrong, would you agree to let Architecture Vivant of Paris have a collection of pictures without compensation (which they refuse to pay) and bring out a special issue of their magazine? I now have spent months on this matter always getting complimentary letters but nothing more. Now I will try with the other New York publishers, whose names you might give me. The slump is world-wide, still all sorts of nonsense is published. (See for your collection the work of Schmidt, Gordon and Martin, for instance the Bundt Factory). Yours, Richard. The Record published Gill without quoting us.” (See below right). 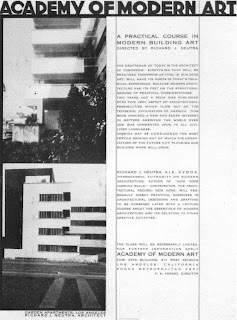 Postcards from Neutra to Morgan regarding publication of a book on the Lovell Health House, December 16 & 19, 1930. From Picnic de Pioneros by Ruben Alcolea, BTC, 2009, p. 270. Willard D. Morgan at Life Magazine. Photographer unknown. Courtesy Lael Morgan, Morgan Archive. In 1928, Willard Morgan was one of the first Americans to use the Leica 35mm camera (seen earlier above) and left Los Angeles with wife Barbara for New York to work for Leica in the fall of 1930. He was also one of the first photographic editors for Life Magazine, beginning in 1936 as freelance contributions editor (see above). This experience in the editorial world resulted in the creation, with his friend Henry M. Lester, the firm Morgan and Lester, and later, Morgan and Morgan, publishers of great importance in the photographic world. 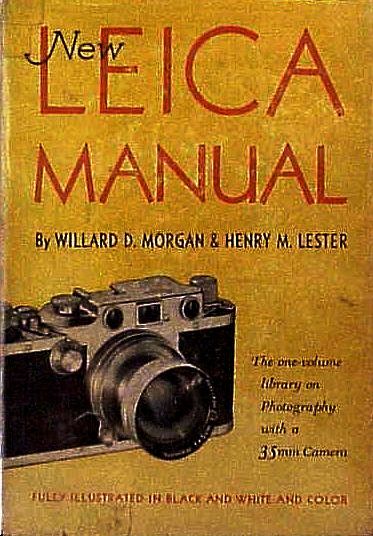 Besides, Morgan published a great number of books dedicated exclusively to photography, including the Leica Manual and Graphic Graflex Photography (seen below), Correct Exposure for Photography, 1001 Ways to improve your Photographs and Famous Photographs and many others. Leica Manual by Willard D. Morgan and Henry M. Lester, Morgan & Lester, 1935. 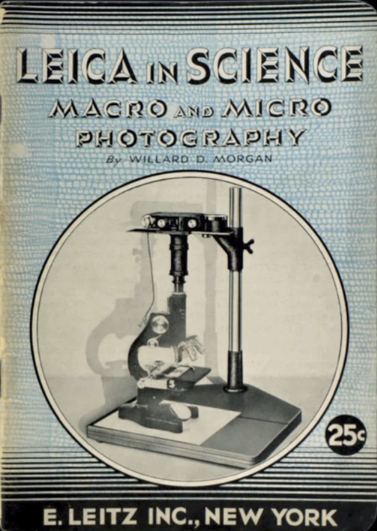 Morgan, Willard D., Leica in Science: Macro and Micro Photography, Leitz, New York, 1934. Courtesy Lael Morgan, Morgan Archive. Willard D. Morgan, "Lovell Health House, Los Angeles, Richard Neutra, Architect," 1929 from above Leica Manual. 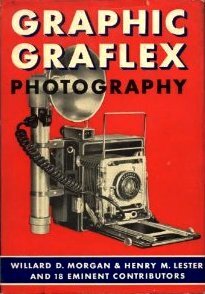 Graphic Grafles Photography by Willard D. Morgan and Henry M. Lester, Morgan & Lester, 1940. Morgan also edited or co-edited numerous periodicals such as The Complete Photographer and U.S. Camera. (See below). U.S. Camera, Vol. 1, No. 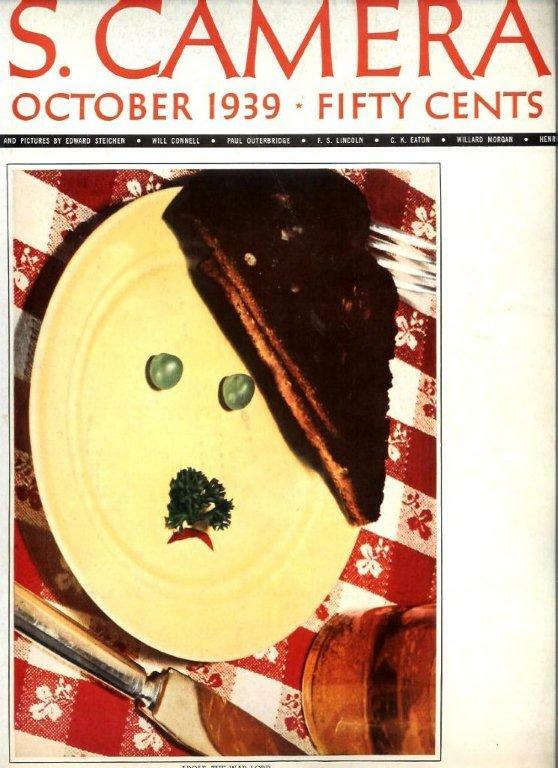 6, October 1939, edited by Willard D. Morgan and others. "Adolf, the Warlord" cover by Hi Williams. 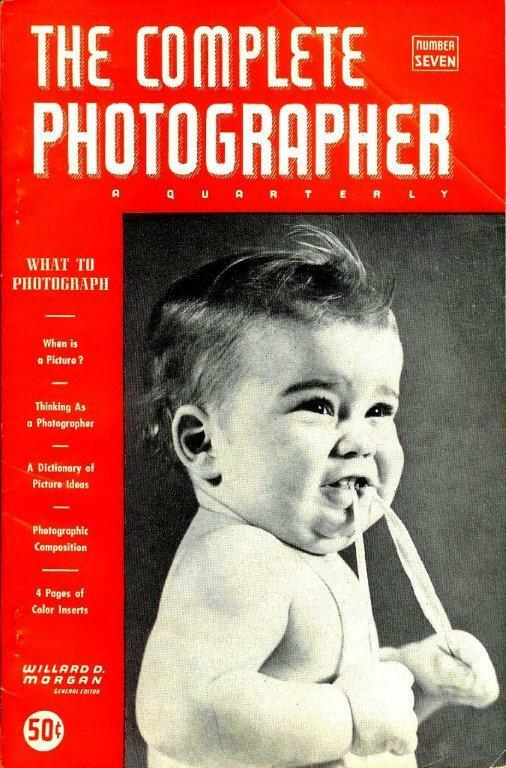 The Complete Photographer, Issue No. 7, August 20, 1945, edited by Willard D. Morgan. Beaumont Newhall, Ansel Adams and Willard Morgan in Barbara Morgan's studio in 1942 in their recently completed house at 120 High Point Rd. in Scarsdale, NY designed by John Weber. From Google Images. Incidentally, this photo session was for experimentation with the new strobe light which had just been developed by Dr. Harold Edgerton of MIT per Lael Morgan, the Morgan's grandaughter. 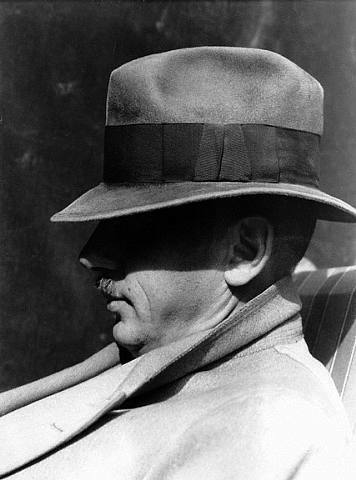 In 1943 Morgan was named the first director of the Department of Photography of the Museum of Modern Art in New York. 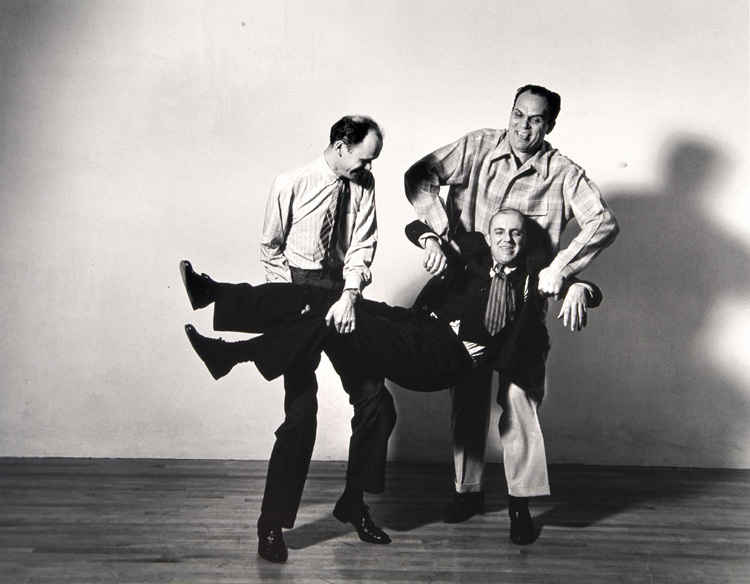 The above photo of Willard roughhousing with MOMA photography curator Beaumont Newhall and their mutual friend Ansel Adams taken in Barbara's Scarsdale home studio not only presages his MOMA appointment but also his publication of a series of highly regarded how-to books by Ansel Adams. While at MOMA Morgan conceived the idea to publish a work of large dimensions, The Complete Photographer, carried out shortly after by the National Alliance, that would eventually become The Encyclopedia of Photography that is still being used to this day. (Steensma, Jennifer, "Willard Morgan at MOMA," in The Willard D. Morgan Archive, Rochester Institute of Technology, School of Photographic Arts & Sciences, 1992). Willard D. Morgan and sons at their John Weber-designed home next door to the Webers' house in Scarsdale, NY ca. 1946. Raymond Neutra spent a week here about this time while his parents were in Puerto Rico. Photo Courtesy of the Morgan's granddaughter Lael Morgan. Barbara eventually joined Willard in the publishing business replacing Henry Lester around 1950. 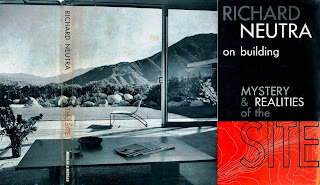 Although Neutra and Morgan were never to find a publisher for thei book on the Lovell Health House, Morgan & Morgan finally published a book on Neutra's architecture in 1951, the now classic Richard Neutra on Building: Mystery & Realities of the Site. (see below). 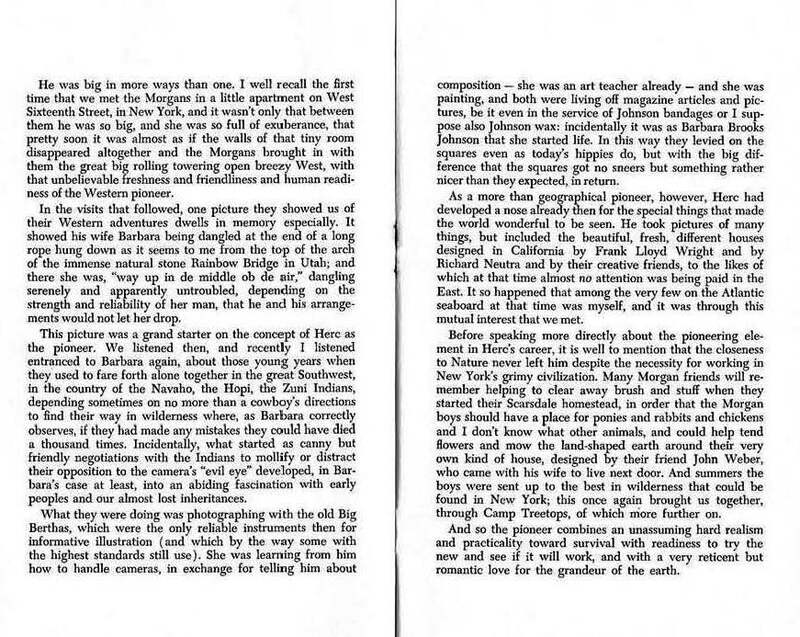 Richard Neutra on Building: Mystery & Realities of the Site , Morgan & Morgan, 1951. (From my collection). Richard Neutra's class at F. K. Ferenz's Academy of Modern Art "A Practical Course in Modern Building Art" seen again below symbolized a crossroads in the history of modernism in Los Angeles. Most of the class participants went on to very distinguished careers and used what they learned from Neutra and their classmates to cross-pollinate all aspects of modern art, architecture and design across their avant-garde circles in Los Angeles. Through their completed work, travels, lectures, exhibitions, teaching and publications they spread Modernism across Los Angeles, the U.S. and the world. 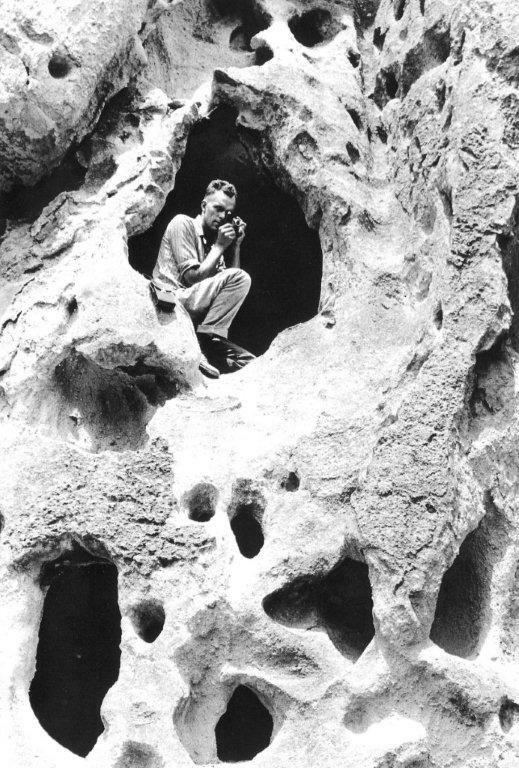 Neutra went on to receive the AIA Gold Medal after publishing (over 5,000 articles) and lecturing around the globe. His disciples, Gregory Ain and Harwell Hamilton Harris had distinguished architectural careers of their own built upon the foundations of Neutra's seminal teachings. Annita Delano taught art and industrial design to two generations of students at UCLA while continuing to exhibit her work. Delano corresponded with and frequently visited her friends the Morgans, John and Alice Weber, and Eleanor Lemaire after their moves to New York. John and Alice Weber Residence, Phase I, Scarsdale, New York, John Weber, 1940. Next door to the Willard and Barbara Morgan Residence also designed by Weber. Special thanks to Lael Morgan, Barbara and Willard's granddaughter and trustee of the Morgan Archive for permission to use this photo. Eleanor Lemaire and lead designer John Weber had a prolific and well regarded corporate interior design practice headquartered in New York for three decades after their move from Los Angeles in 1930. 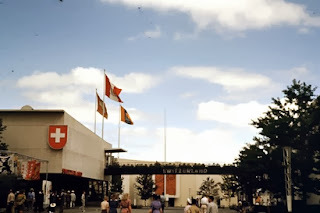 In association with countrymen William Lescaze and Herbert Matter (exhibit design), John Weber also designed the Swiss Pavilion at the 1939-40 New York World's Fair (see below). He also designed modern houses for himself and wife Alice in 1940 (see above) and the Morgans next door at 120 High Point Rd. 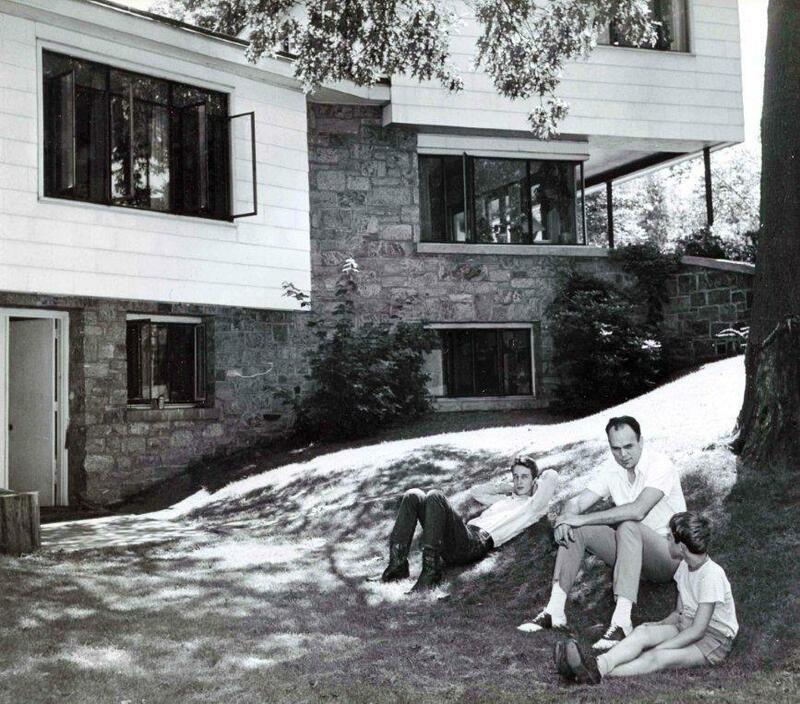 in Scarsdale in 1941 which appeared in House Beautiful Magazine (see earlier above). The Neutras also visited the Morgans whenever they were in New York. (For much more on Herbert and Mercedes Matter and their WWII years in Los Angeles see my "Herbert and Mercedes Matter: The California Years."). Swiss Pavilion, New York World's Fair, 1939, John Weber, William Lescaze, Herbert Matter, designers. Lemaire was also deeply involved in the New York World's Fair having been chosen to serve on the selection jury for the popular "America at Home" exhibition alongside such luminaries as industrial designer Gilbert Rohde and architect Edward Durrell Stone (see below). 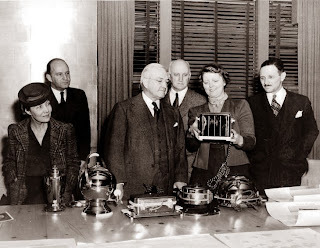 Selection panel for objects appearing in the "America at Home" exhibition at the 1939-40 New York World's Fair. From left, Dorothy Liebes, designer; Edward Durrell Stone, architect; Harvey D. Gibson, Chairman of the Board of the World's Fair of 1940; Forrest Grant, Director of Art for New York Public Schools; Eleanore Lemaire, designer; and Gilbert Rohde, industrial designer. New York Public Library Digital Collection. Barbara Morgan compiled a very productive career as a teacher, artist, photographer and publisher. Willard Morgan was extremely prolific in the fields of photography marketing, writing, editing, curating and publishing. F. K. Ferenz went on to gain notoriety as a Nazi sympathizer during the mid-1930s and 1940s. Little is known of the rest of the students but this Academy of Modern Art "Class of 1929" will long be remembered for its cumulative impact on the modernization of Los Angeles. Finally, the Morgan family heirs have recently found a permanent home for the Morgan Archive at Barbara's beloved alma mater UCLA. 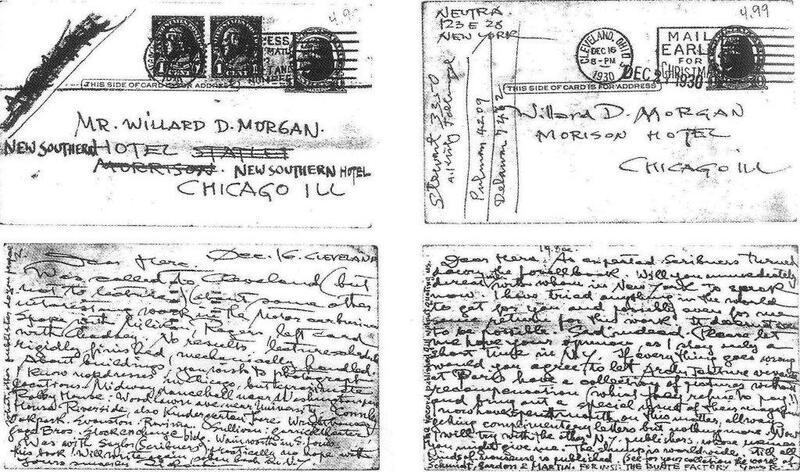 For more on this go to: "Morgan Archive Now at UCLA. "